Nothing to Declare’s world tour is still rolling on, over a year since release back in June of 2017! 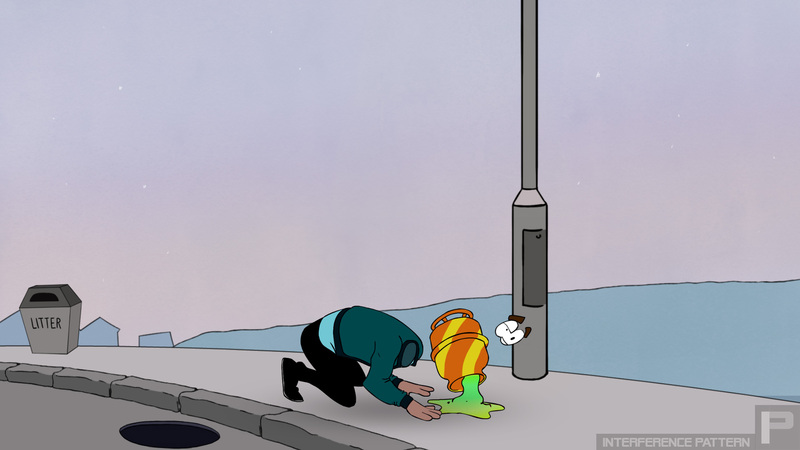 Over the summer we screened at the prestigious Zagreb – World Festival of Animated Films. Upcoming screenings include the 13th Anim’est International Animation Film Festival in Bucharest, Romania, which runs from September the 28th until October 7th. 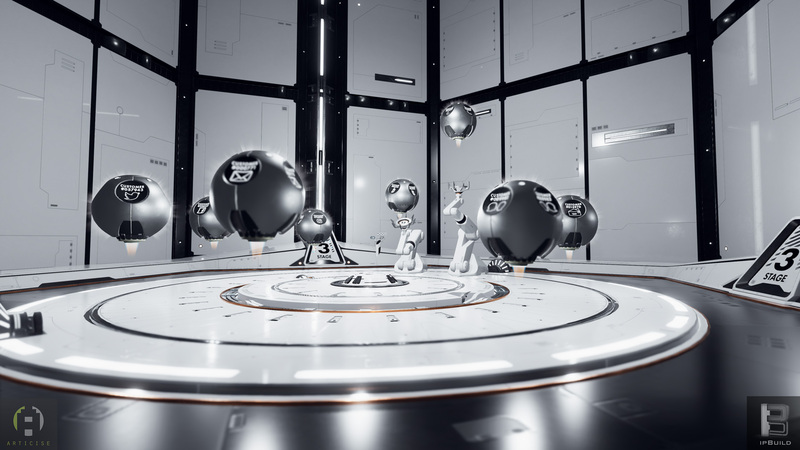 The Interference Pattern and ipBuild teams have yet again been dabbling in realtime virtual worlds, producing another rich and visually immersive VR experience, this time for the online retailer, ASOS. 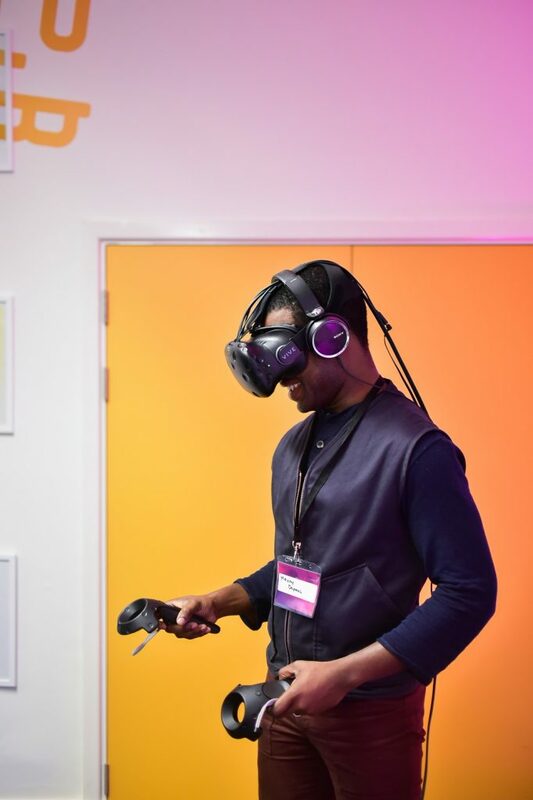 The brief, to create a 4 minute virtual reality experience for ASOS’s customer care team, to communicate what it takes to be an effective team member. 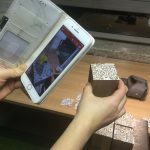 Working with our regular development partner, Edinburgh based design, development and technology studio, Articise, the ipBuild and Interference Pattern teams created all the 3d content, from modelling. 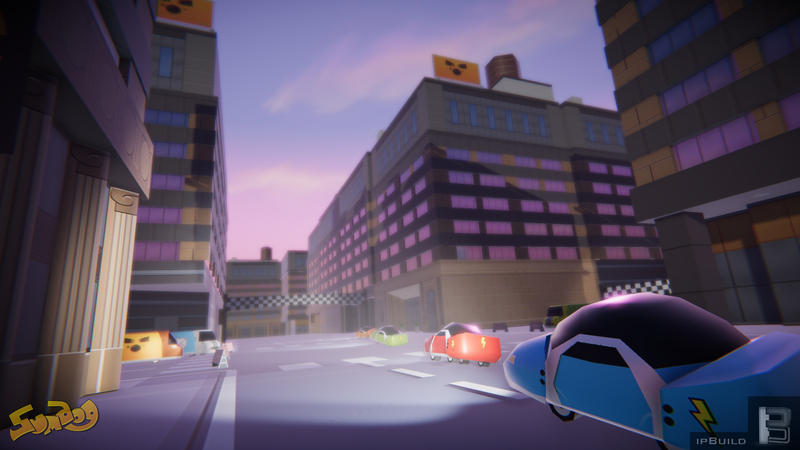 animation through to the lighting and visual implementation within the Unity 3D game engine. With an ambitious creative brief from the client, the team were let loose to do what they do best, and created this visual stunning experience. In our Spring 2018 newsletter, discover about our globally viewed and appreciated work, feature and short film projects alongside educational animation and games content. There is also the chance to sign up to join our 10 year celebrations and to receive continued communications from Interference Pattern and ipBuild. We work with studio partners like Passion Pictures, Axis Animation, Electric Theatre Collective and Articise to develop world class animation work that is broadcast to multi millions of viewers. Here are a few examples of projects for which we have created 3d assets, via our outsourcing service ipbuild. Inuit – A Giant Story – We created and textured a range of environments, with additional asset support for props and vehicles, for this jaw droppingly beautiful short promotional film for book-keeping software Inuit that was created to link-in with the shorter Super Bowl commercial. It has now been viewed on youtube over 21 million times. 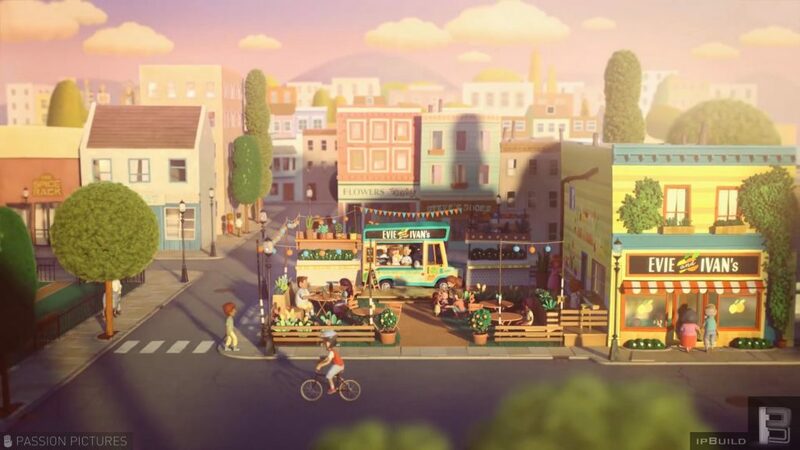 Chipotle Short Film – Cinema Screening and People’s Voice – Webby Award – Ipbuild contributed 3d assets (both environments and vehicles) to the Chipotle short film that was initially screened in US cinemas. This work blurs the boundaries between a short film and an advertising commercial and was viewed on youtube over 12 million times, winning the People’s Voice – Webby Award. 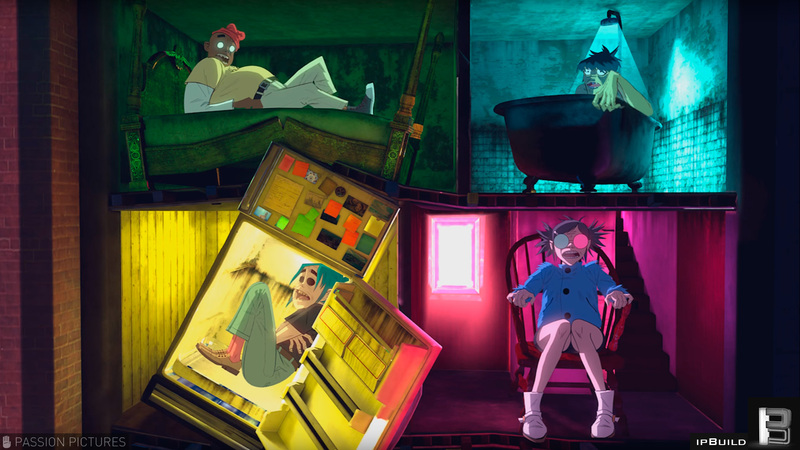 Gorillaz 360 – Most popular VR music video – A VR project back from the archives in 2017, for which we created all of the environments, Gorillaz Saturnz Barz 360, which became the the most popular music video VR debut, with much critical acclaim. Created for the Google Spotlight Stories platform, the 360 video has so far been viewed nearly 12 million times and the 2-d version nearly 67 million times. James Wellbeloved – Mega City – Best Animation in a Commercial – BAA Awards – We enjoyed environment texturing for this lovely commercial for James Wellbeloved dog foods. The commercial won Best Animation in a Commercial in the BAA Awards. 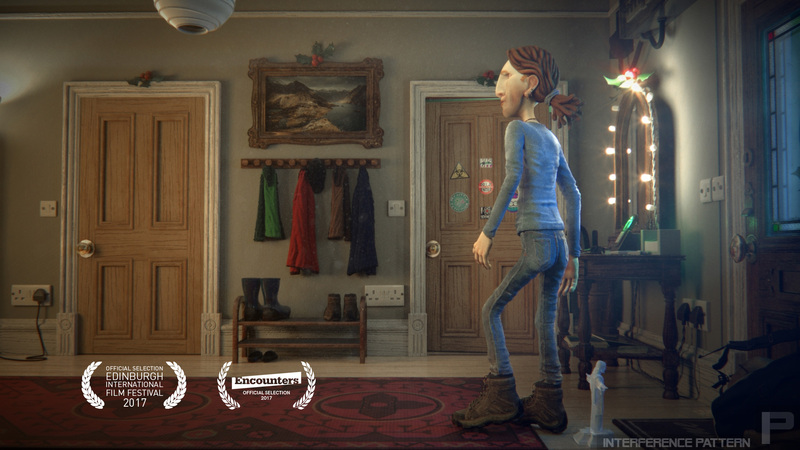 Nothing to Declare – Our Short film – Nothing to Declare was an Emile Award ambassador selection and the film is currently on the European festival circuit. Nae Pasaran- We created VFX for the documentary feature film, Nae Pasaran which closed the 2018 Glasgow Film Festival and is currently on tour around the globe and scheduled for release later in 2018. Drinkaware – We created four new informative and stylish animations for the Drinkaware campaign, this time focused on women’s health. 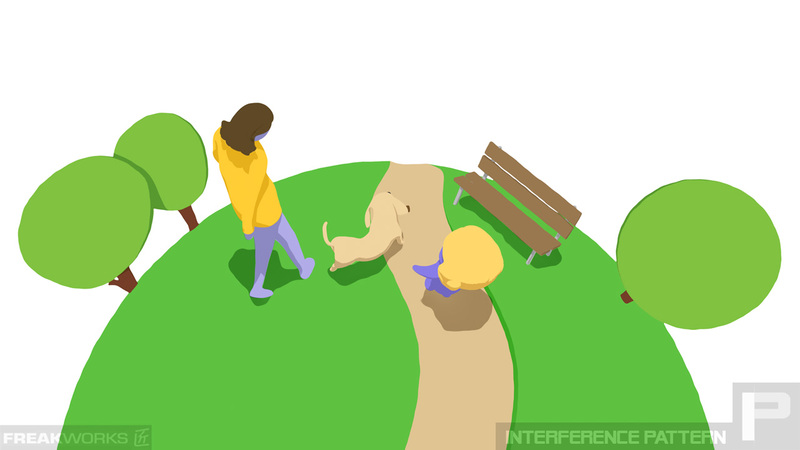 Sumdog Games – A popular household game name for primary age school children is Sumdog games and we’re delighted to have created all 3d content for most of their 3d games over the last couple of years. 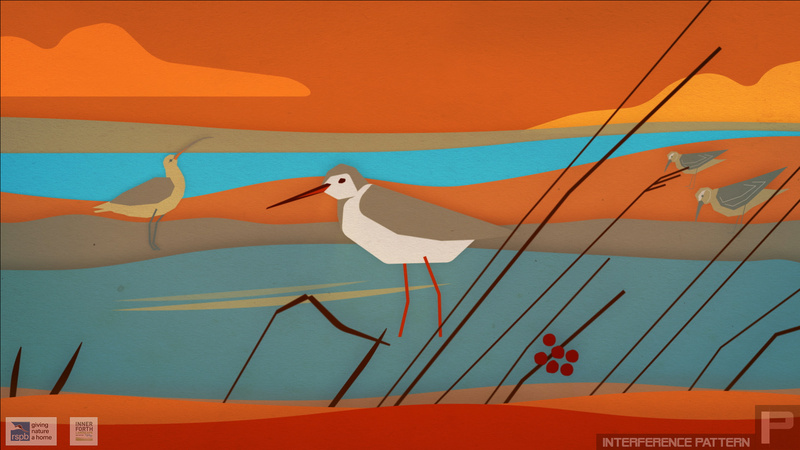 RSPB – We recently also created a vibrant and stylish educational film for the RSPB’s Inner Forth Landscape Initiative, for school-age audiences. Taking a brave and refreshing visual approach to an educational animation, the piece has been well received with the target audiences. We have just wrapped up production on a new suite of four animations for alcohol awareness charity Drinkaware, this time focusing specifically on the effect of drinking excessive levels of alcohol, on women’s health. 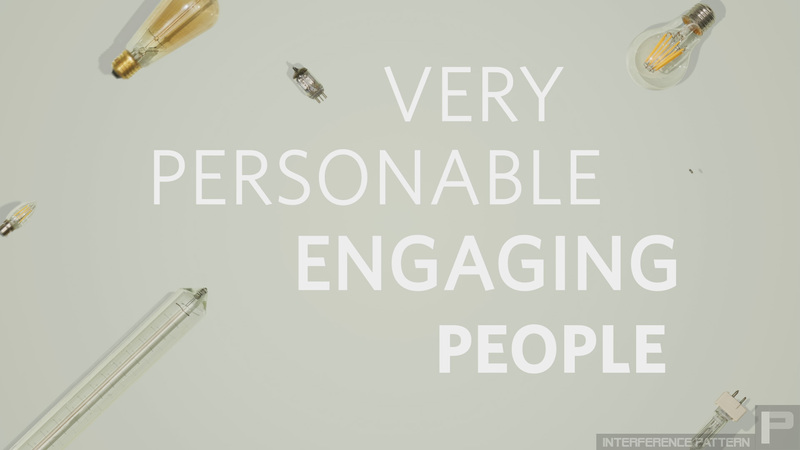 Informative without preaching to the viewer, they convey a message of moderation in a slick and engaging way. 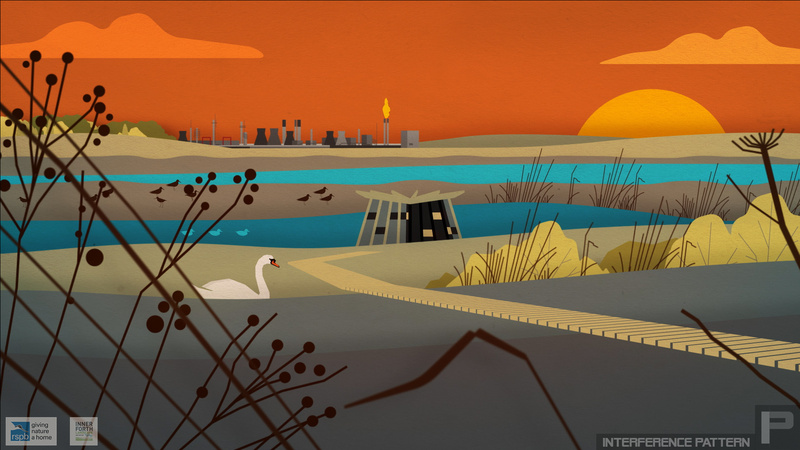 We are delighted to announce our work for the RSPB producing this vibrant animated film for the RSPB Inner Forth Landscape Initiative to educate local school children about the history of the Inner Forth’s changing landscape. Detailing the influencers for these changes and looking into the future for the area, the film is to be used as an educational support tool for local primary and secondary schools in the region. You can watch the film in full online at this link and also hear a little about the project from our client’s perspective at this RSPB blog by Project Assistant for the Inner Forth Futurescape Project, Ami Kirkbright. On Sunday 4th of March, Nae Pasaran, an independent feature documentary film by Edinburgh based Debaser Filums, charting the true story of the Scottish anti-fascist, peaceful, civil disobedient workers who defied the Chilean dictator Pinochet, had it’s it’s world premiere screening, at the closing gala for the 2018 Glasgow Film Festival. The film had an overwhelmingly positive reception from the audience with an almost endless standing-ovation as the closing credits rolled. It was lovely to see the film receive the reception that it deserves as it’s a brilliant and deeply moving piece of storytelling. We were doubly proud as Interference Pattern provided the visual effects sequences for the film. Working on an incredibly constrained budget, our team poured many weeks of our own time into the project to ensure that director Felipe Bustos Sierra received the shots he needed. Our work involved a wide range of shots, from fully realised virtual environments, complex time-lapse sequences to the destruction of architectural treasures. 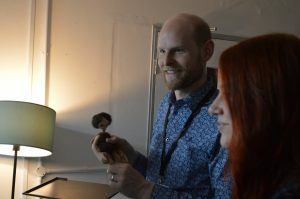 “I’d spent the weeks before Move Summit watching our production team shrink as one-by-one my colleagues got roped into the monumental effort that is organising an animation festival. My job was to hold the fort at Interference Pattern HQ though, so that meant that when I made it to Move Summit on the Friday I could relax and enjoy myself as a delegate. And I had a fantastic time! 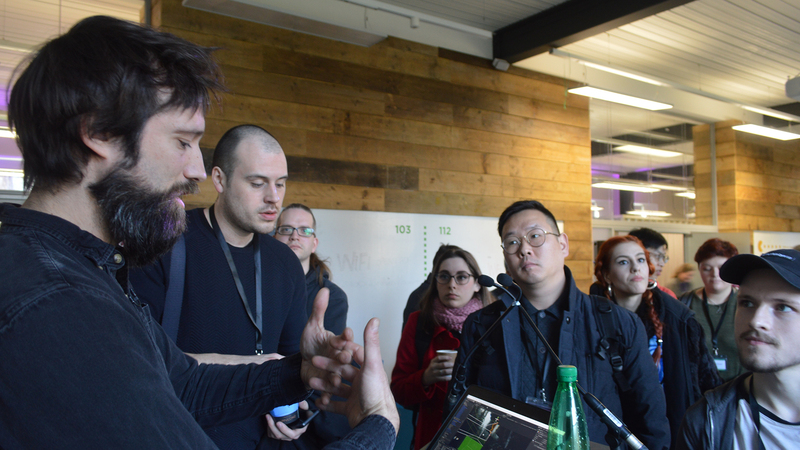 With coffee and pastries in-hand we headed into two of the stand-out talks of the event: Dr Stuart Sumida: Animal Anatomy Consultant, and Mathieu Muller: Unity Field Engineer. Both speakers were absolutely inspirational and mobbed by people wanting to ask questions afterwards (Mathieu was so happy to take questions and chat to delegates that he eventually had to be rescued for lunch before the sandwiches ran out). Neil Riley’s Electric Theatre Collective talk was the highlight of my afternoon. Partly because of the creative and open-minded way they approached their Great Western Railways commercial – but mainly because Neil admitted that a couple of shots were still at pre-vis stage just weeks before final delivery. Clearly they pulled it off brilliantly and delivered a fantastic piece of work on time but it’s good to know that in the creative industries, where you’re trying to achieve something new with every project, it’s rarely the case that things progress in a nice smooth linear fashion. Having a decent contingency plan-B (or G, or Z) is more important than sticking rigidly to plan-A, and that gives you the freedom to break new ground creatively as you work. 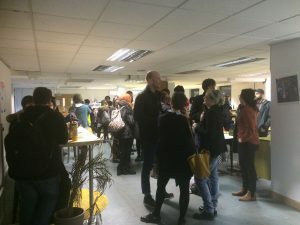 Then, when the afternoon talks had finished and someone had handed my my first beer of the evening I got to catch up with friends & colleagues, chat to some of the day’s speakers, and meet some passionate and talented students and industry-entrants. 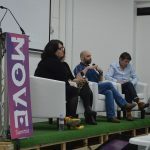 Whilst the speakers and talks at Move Summit were top-class and genuinely inspirational, I think what struck me most was how much it served as a melting pot and incubator of ideas. I heard studios giving from-the-coalface feedback to a unity developer who, in turn, was musing on how to implement some of the creature morphology commandments laid down by a anatomy professor. At the other end of the spectrum I spoke to loads of student who’d got a real insight into the industry and had feedback and advice directly from representatives of studios that they dream of working in one day. Move Summit magic – reasons for a sell out success? Here’s the top 5 aspects which make Move Summit very, very special! From my perspective as co- founder and director for 2017 and 2018, but influenced by lovely comments on the day too! 1. Speakers who hang out all day and night! The great thing about our speakers at Move Summit, is they tend to get absorbed in everything that is going on during the day and evening! I’ve been to many events across the globe where speakers rush in and out for their talks, without time to take a breath and talk with other delegates. 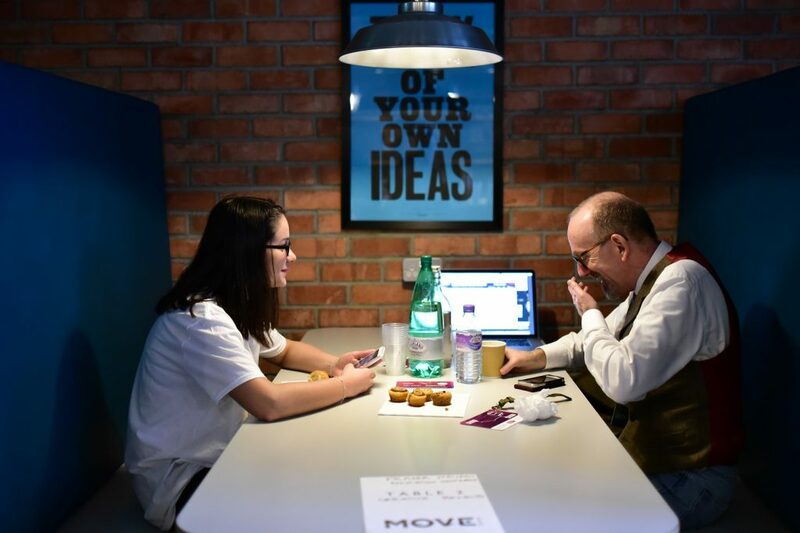 With Move we’ve been so fortunate that our speakers love to stick around – they arrive early, they leave late and they do a lot of organised and informal helping in between. 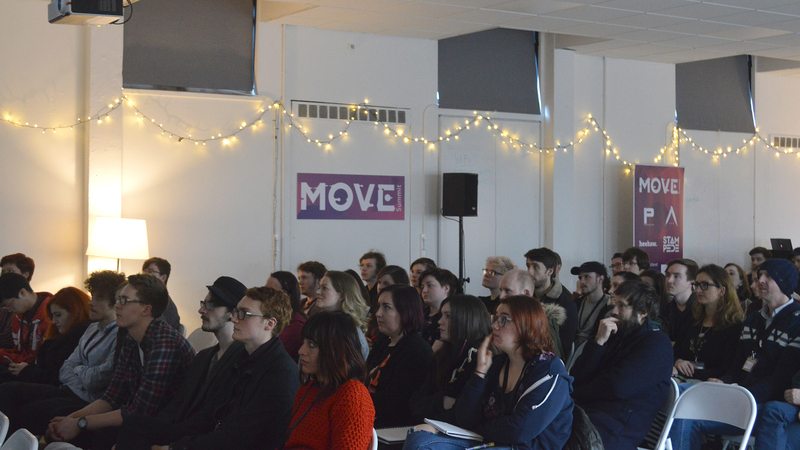 This has taken the form of our returning creative reviews for students, new speed pitching sessions, all alongside answering one to one questions after their talk, and mingling with the delegates for our evening activities. Quite often our speakers are among the first and last ones standing! On that note, stamina winners for last standing place are in 3rd. Mathieu Muller of Unity 2nd. Damien O’Connor of Brown Bag Films 1st . Paul Wells of Animation Academy But who wins this year’s Speaker Hero Award? Last year the award went to duo Lee Greatorex and Doug Lamour of MPC for making to Move after an extremely long delay in Storm Dorris. This year the Speaker Hero Award goes to Tom Box of Blue Zoo! Who delivered three talks in one day – his own talk on his animated short film Mamoon & other works, followed by last minute stepping in for a talk on ANIMDOJO, and thereafter graciously accepted an invite from Bafta Scotland to talk about his Bafta nominated film. Kudos! Okay, animation delegates have a hearty appetite, on that note does anyone out there want to sponsor our catering? 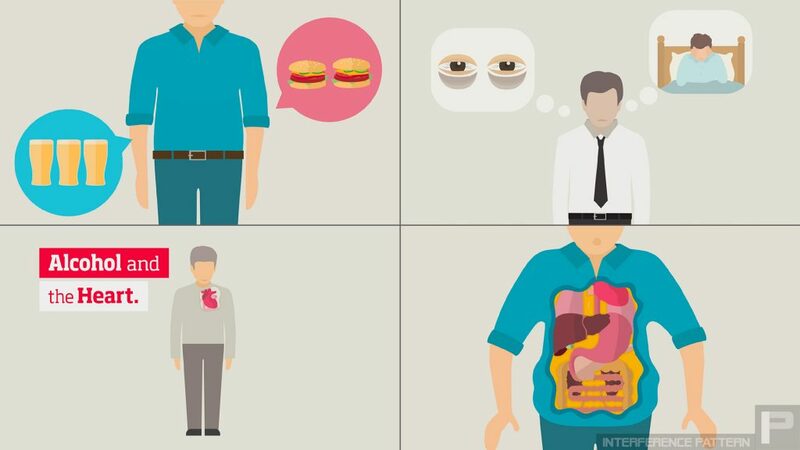 But we’re not referring to the eating hunger here, but the hunger to: learn, connect, make the most of your time at Move! The organisers feel it, but more importantly the speakers feel it (thanks to living screenwriting legend Paul Wells for coining the term!) It makes their time worth while as they want to be helpful. There is not one blase or bored attendee at Move (we even had emotionally moved delegates with the Blue Zoo film screening). This is why our speaker have already asked to come back, as they know they’re donating their free time (off their normal day where they earn money) to a worthy cause where they had fun in the process, they like our vibe. The added bonus is speakers become ambassadors to help spread the word of Move, and this year we’ve an International Ambassador Dr Stuart Sumida from the USA who is consulting expert to animation studios all over the world. With another sold out event, the volunteers team time is truly valued too with a full attendance and high energy delegates. Move is a grass roots industry initiative, that is a community run and a non profit event and ticket income along isn’t enough to cover costs of the event. So we rely on industry sponsors to help make Move happen with their lovely thick wad of cash donation. But moreover, they donate in-kind – their time, their skills and expertise on the day or in the lead up to the event. 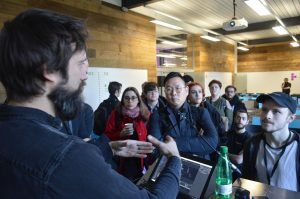 Interference Pattern – who were the lead organisers, donated time of five employees, curated speakers and sponsors, and brought together the winning team. We created Move Summit as an scalable extension of our industry connection work with colleges and universities. We wanted to bring in world class speaker talent via our wider network, to give equal access and benefit to all students and professionals. The super cool space for creatives Whitespace who have supported Move since day dot, the place for tech and creative companies to be based – Codebase and for learning tech skills – Codeclan. Also our event run smoothly thanks to our expert AV suppliers and technicians Vision Events. 4. Volunteers who share your passions! None of the volunteers day jobs are as event organisers, and the majority of them fit in Move planning in their spare time. So we may not be perfect, but we are passionate! Our team has that magic ingredient that money can’t buy, the same interests as you and they have your back! They want to help you: improve your knowledge and skills for career progression, make that connection whether for a job or creative collaboration, and to lift up your individual and the Scottish animation industry enterprising aspirations and to provide opportunities and pragmatic solutions for them to be realised. 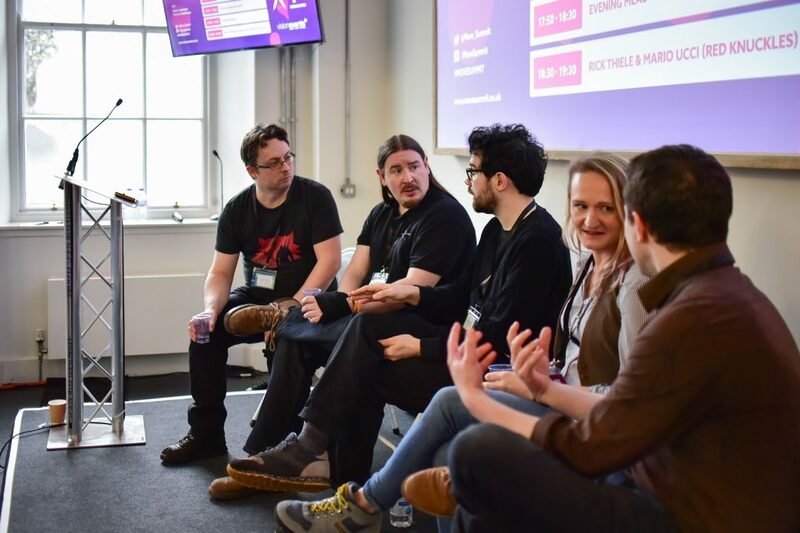 A big thanks everyone else who donated their time, including our volunteers on the day and our amazing hosts who love animation like you do – Kate O’Connor from Animation UK, Erik Ravaglia, Iain Gardner of Animation Garden, and Move’s own Caroline Parkinson of Interface. During Move at Whitespace, we had the impressive Soluis demoing their ace VR work for Tottenham Hotspur Stadium. 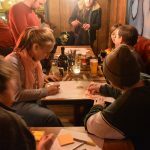 Evening activities at Move Late were popular as ever, as Holly-May Ward extended her organisation to develop a lovely relaxed evening of activities, on Thursday culminating with a Drink and Draw session at the lovely Brewdog pub. Friday night’s awesome Move Late included a cool tech exhibition and demo area with VR and AR for the crowds to don the goggles and be entertained. Bright Side Studios, Vitei Backroom giving us a world exclusive first play of their new game Paper Valley, and our very own Interference Pattern along with Articise with a demo of their recent VR work. 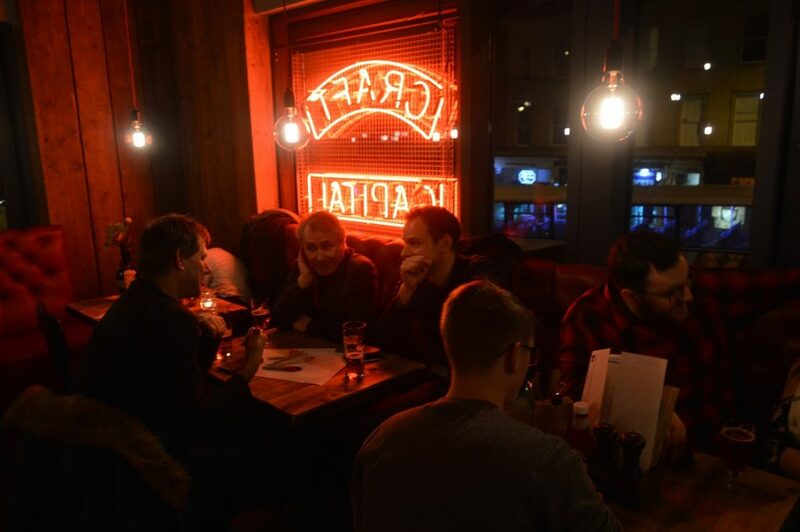 With the addition of Stewart Brewing craft beer and pizza, and the magic ingredient of a hugely sociable crowd networking to the max closed the event perfectly. I couldn’t be at three venues and witness all the awesome goings on, so we need your help with your feedback as I’m sure I and the team missed loads! Along and with any links to your reviews/photos/blogs of 2018 and please complete the review survey. Who do you want to hear from and meet at Move Summit 2019? Send your ideas to info@movesummit.co.uk please. Thanks! Move Summit 18 – It’s a wrap! That’s a wrap on another successful year of MOVE Summit! Move Summit host @ Whitespace, Erik Ravaglia warms up for the day! 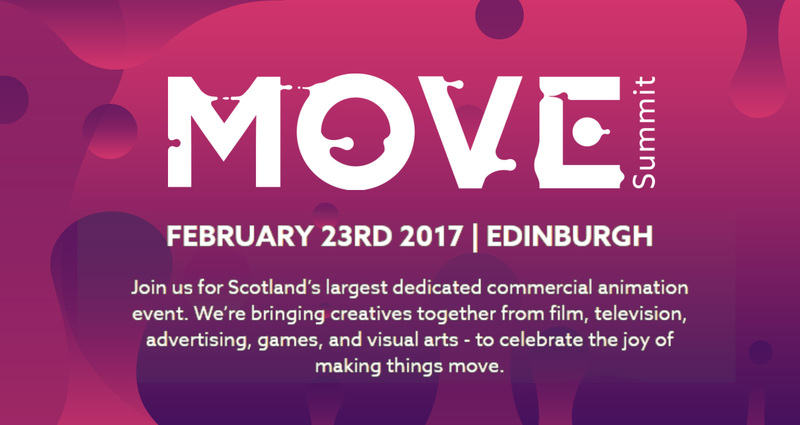 On the 15th and 16th of February the Move Summit animation and vfx festival took place here in Edinburgh. 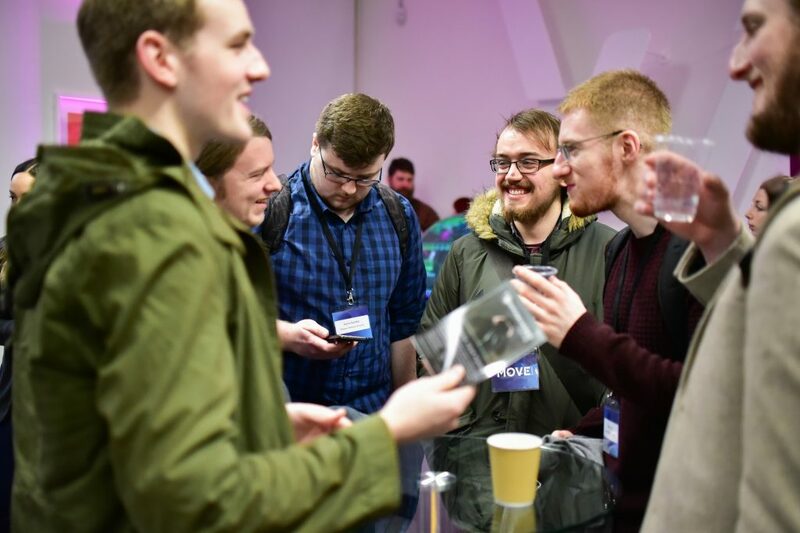 Move Summit is Scotland’s only dedicated animation industry event and now in only its second year, Move Summit has gained a large following from within the industry and education alike selling-out for consecutive years. This highlights the need for such an event and also serves to highlight the conspicuous absence of one, prior to the inaugural Move Summit in February of 2017. The goals of the summit are to educate, promote and inspire within the animation, visual effects, visualisation and games industries, pulling together practitioners, students and studio representatives from around the world for two days of networking, discussion, learning and hopefully forging long lasting relationships. For the second year running, Interference Pattern acted as the keystone of the summit’s organisational team, a brilliant group with whom we pulled together an extensive programme, expanding on last years event in almost every area. Mattieu Muller of Unity 3D talks with eager delegates after his presentation. 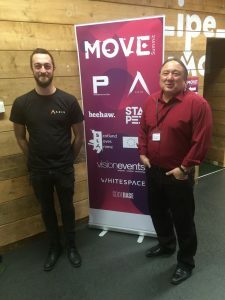 As one of the directors of Move Summit I had the pleasure this year of both coordinating the professionals schedule, in conjunction with Sharon Campbell (animation course leader at Duncan of Jordanstone in Dundee) as well as overseeing the operational and financial sides of the event management. It was a lot of responsibility to take on, especially alongside my duties as MD and creative director at the Interference Pattern studio but all of the hard work and long hours over the past few months have been absolutely worth it. The feedback that we have received from attendees and speakers has been overwhelmingly positive. We are already in the early planning stages for 2019’s event and looking at how we can incorporate feedback and consultations to continue to improve and evolve Move Summit, to deliver what the industry and education need from the event. The professionals schedule was a packed programme of talks, panel discussions and workshops spread between two seperate venues, over two days. 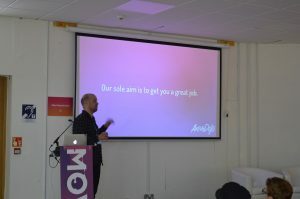 We had speakers from Aardman Animations, Blue Zoo, jellyfish Pictures, MPC, Axis Studios, Unity 3D, Electric Theatre Collective, Brown Bag, Boulder Media, Soluis, to name but a few! Pulling together such an extensive schedule was a challenge but we succeeded in not only upping the volume of content on last year but also maintaining the high quality levels that we set ourselves. 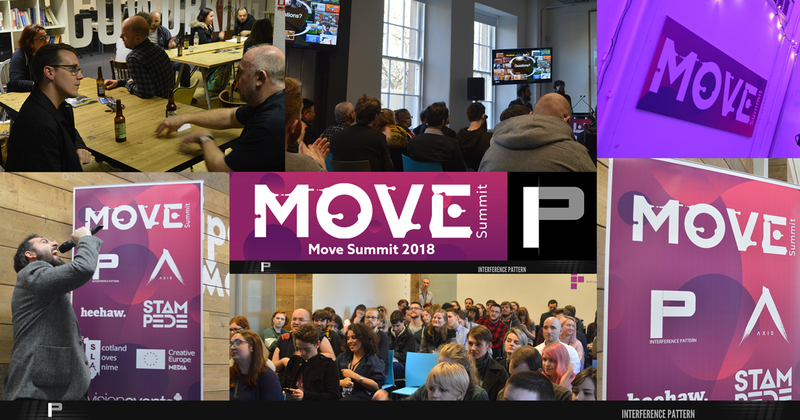 The Move Summit 2018 schedule in full – what a lineup! Alongside the professionals and industry aspect of the schedule we ran a full days programme dedicated to emerging talent, which we define as those either currently engaged in full time education or the recently graduated who still have to find employment. This day featured workshops, inspirational talks and panels, all geared towards portfolio presentation and getting students fired up and job-ready. I was a member of a panel presentation discussing industry tips for students putting together their portfolios, in readiness for applying for work after graduation. It was reassuring to hear that all on the panel were virtually unified in our desires for what we like to see in a portfolio and how that should be presented to prospective studios. 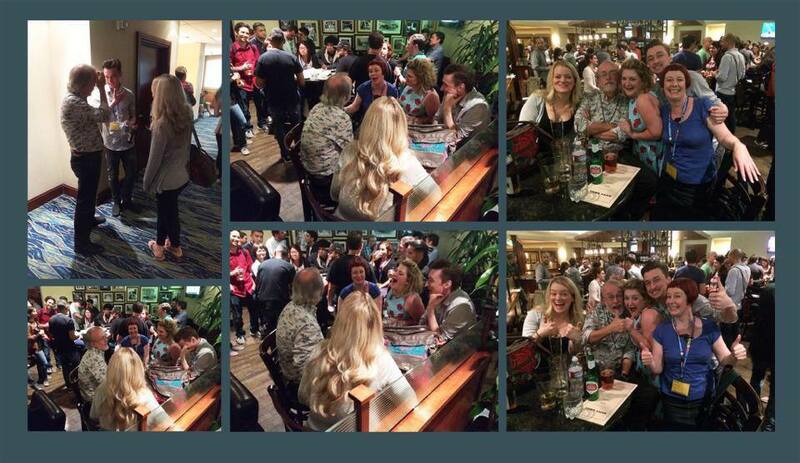 A popular thread of last years summit, the student portfolio review sessions, were back this year by popular demand. Yet again we expanded on what we offered last year and were running review sessions throughout the two days of the festival. These reviews allowed students and artists to sign up for a 15 minute slot where they could present their portfolio work to an experienced professional for feedback and discussion. An excellent way to get students talking critically about their own artwork and also to get potentially good candidates in front of those studio representatives who need to see that work. 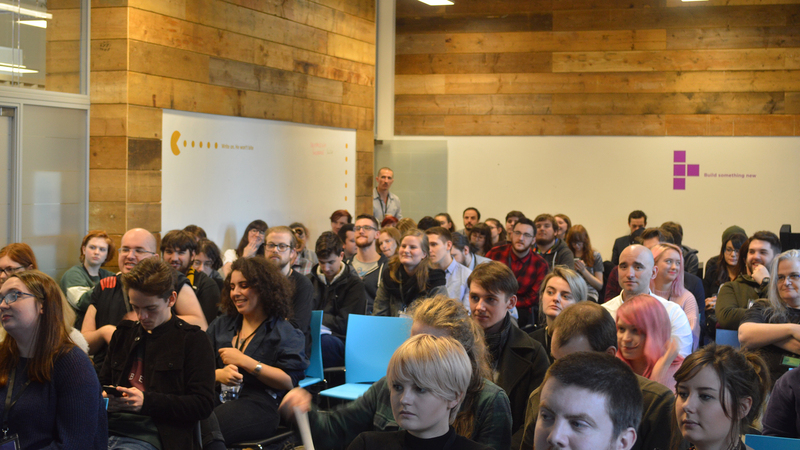 Our team of reviewers was a crack-team, assembled from our wonderful guest speakers, studio leaders and department leads from within the Scottish industry, higher education course leaders, alongside talented artists currently employed within the Scottish animation industry. 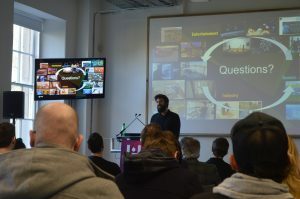 I doubt that many of the students attending would have expected that they would have the opportunity to present their work to the likes of Tom Box, MD of Blue Zoo, Tom feist-Wilson of Jellyfish Pictures, studio team-leads from Axis Studios or Mattieu Muller of Unity. Emerging talent portfolio review sessions in full swing. We capped the portfolio review thread of the summit off with a round of rapid-fire student speed-pitches, at the end of Friday’s speaking programme. Squeezed in before dinner and the Move Late after-party VR exhibition kicked off the students were all in a talkative mood and fired-up after the days excitement. yet again our group of gamely speakers and studio representatives stepped-up to the task, to field 30 minutes of thee lively drop-in sessions. I had great fun participating in both the reviews and the speed pitches and really see this as one of the successes of the event. 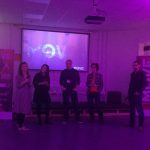 For me being able to facilitate getting artists at the start of their careers in front of those with the knowledge and advice was heartening to see and made me proud of what we have achieved so far with Move. Student speed-pitching sessions in full swing. Throughout the year and leading up to the event Interference Pattern has provided crucial financial and organisational support, forming a core of the organisational team. 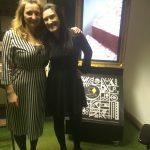 Our business and community development manager, Jayne Coulthard acting as Move Summit Director and myself as Financial and Operations Director and co-curator of the professionals programme. We worked throughout the year pulling together the threads of the event along with the wider organisational team, ramping up to almost full-time during January and February, making sure that we had all of the organisational details covered and everything needed in place. Even so, we were still up until the early hours the day before the event fixing all of the attendee and speaker names stickers to our lovely lanyard cards and improvising a solution to the problem of having ordered plastic pockets too small to hold the nicely printed cards we had printed to place inside. 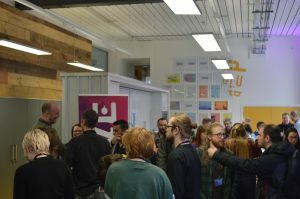 This year the event was only made possible by our generous financial and in-kind support from our sponsors, a range of studios and companies who share our vision for the Move Summit and the positive message and action that it can take forwards about the Scottish animation industry, to the rest of the world. We truly are an industry-led event, by industry, for industry. 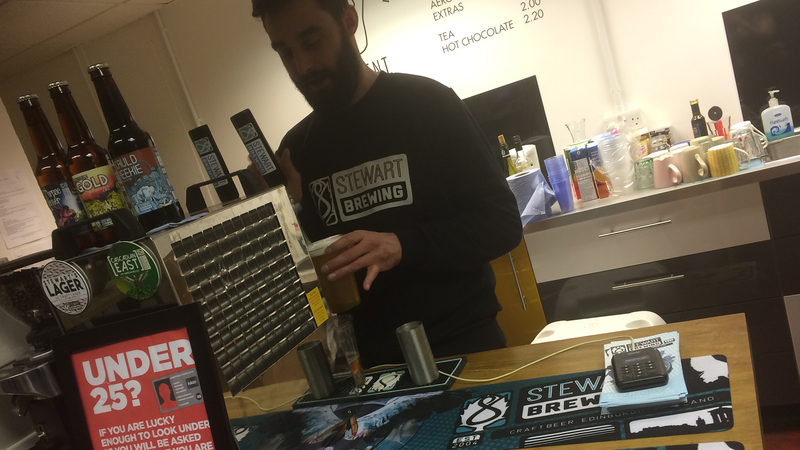 Our very own private bar at Move Late, serving draught craft beers, courtesy of Stewarts Brewing. 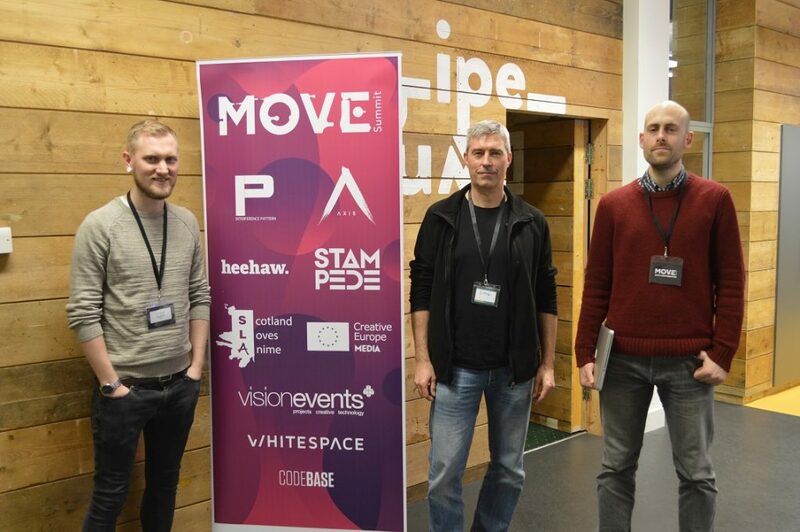 Finally a huge thanks and shout-out has to go out to Move’s sponsors, animation Interference Pattern, Axis Studios, Anime Ltd, HeeHaw, Stampede, Whitespace, Vision Events and Creative Europe. Alongside our key sponsors I also wish to thank all of our affiliate partners for helping to spread the word to their networks. Spreading the word to as many people as possible will enable the summit to grow and prosper and hopefuly the sector as a whole in scotland along with it. Thanks from the organisation team to all those involved in this years Move Summit 18, be it speakers, volunteers or attendees. 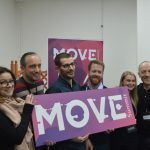 We are looking forwards to showing what we can do with Move Summit 2019! Founder and Creative Director at Interference Pattern. Congratulations to all of the nominees and winners of the 2017 European Animation Awards (EMILE Awards). Whilst we did not win we are incredibly proud that our short film collaboration, Nothing to Declare was selected by the UK’s ambassadors to represent the UK as it’s short film entry to the competition. Unfortunately we didn’t quite make the cut for the final shortlist of 3 films but we think making it to the longlist is pretty special. You can check out some of the work on the film here, but it’s just a peek as we don’t want to spoil the surprise until you get a chance to see the film on it’s current festival world-tour! 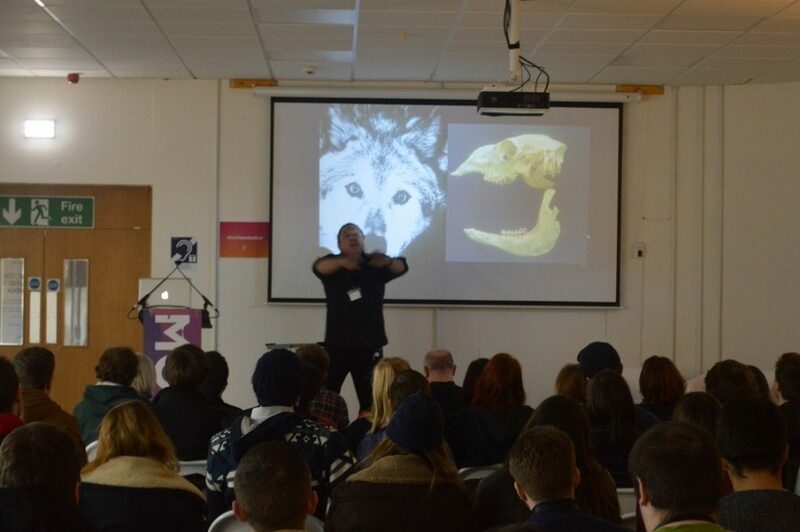 It was great to spend a couple of days at Manchester Animation Festival last month. I was down there for the screening of our short film, Nothing to Declare but also caught up with friends and saw some beautiful animation and excellent talks. Nothing to Declare was screening in the shots program and I’m proud to say that it was part of a really strong line up. I particularly liked Evan DeRushie’s witty Birdlime and had to wipe away tears after seeing Michael Cusack’s incredibly poignant After All. The student films were also outstanding. Garden Party, by a team from MoPA, is technically astounding with production values that any professional studio would be incredibly proud of. Florian Maubach took a much more lo-fi approach with his Cops and Robbers, but absolutely captured what it is like to be straddling the line between childhood and teens. Between the animation screenings there were some great speakers. I was brought up short during the Brexit panel when Jellyfish Pictures’ Phil Dobree quoted the number of non-brits currently working in animation in the UK (50% of animators and 85% of creature TDs if memory serves me). There was talk of more outsourcing and of opening European outposts but it’s hard to see how these things will fill such a big hole. At the moment British universities are not spitting out enough production-ready graduates so will we see a cull of UK animation studios as work follows talent abroad after Brexit? On a much more positive note it was lovely to get lost in the interactive worlds presented by Nexus’ Clair Spencer Cook. After the success of Nothing to Declare we are looking to develop our next IP as a VR project so I was taking copious notes as Claire described how they’d planned the storyline to Rain or Shine in both time and 360° space, and used ingenious sound design to direct the viewer to the action. Manchester itself was fantastic, it’s a city with a real buzz and incredibly friendly people – I’ll definitely be back next year. 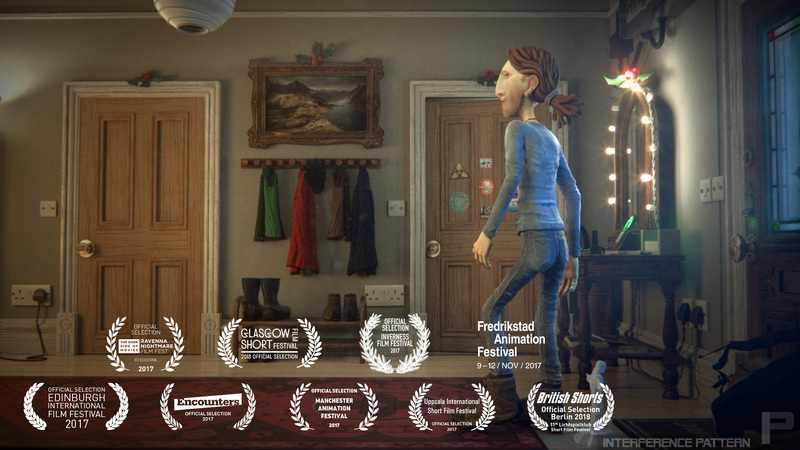 Incredibly excited to announce that our short film collaboration, Nothing to Declare, has been selected for screening as part of the official selection at the 2017 Manchester Animation Festival, running from the 14th until the 16th of November. The film is screening as part of the Short Films 2 selection, showing at Tue, 14 Nov at 19:15 and Wed, 15 Nov at 10:15. We will be attending the festival in Manchester to represent our work on the film, and if you would like to have a chat please look out for us at the screenings and other events during the festival. We are delighted to announce that our short film collaboration, Nothing to Declare, has been selected for screening in competition at the 23rd Encounters Short Film Festival, in Bristol from the 19th until the 24th of September. The film is part of the Sci-Fi: Other Worlds selection, showing at 8pm on Wednesday 20th September. We are looking forwards to attending the festival in Bristol to represent our work on the film. We are officially announcing Move Summit will return 2018! Interference Pattern wanted to create this cosmopolitan animation festival to celebrate and stimulate innovation, collaboration and international outlook in the industry. 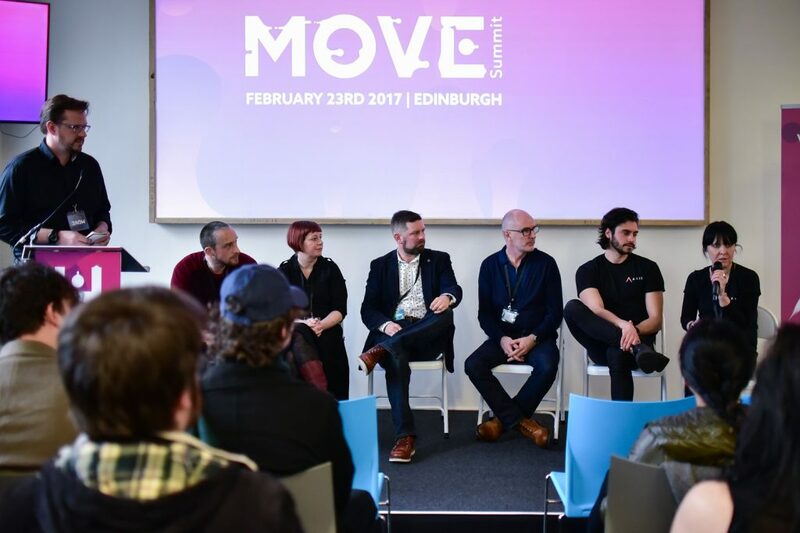 The vision became a reality, as Move was wholeheartedly adopted by the community from Inverness to London, and gained valuable industry support. Thank you for the requests for Move 2018, do you want to help this event become bigger and better next year? Join us as …..
an a industry supporter, please contact Jaynec at interferencepattern.com – and join confirmed 2018 supporters Axis Animation, Soluis, Whitespace, Heehaw, and Animation Centrifuge. Animation Garden‏ Virtual Reality/Games panel Move_Summit Well done! 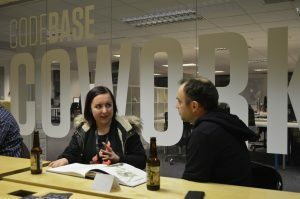 Finally Scotland’s Games & Animation sector under one roof! 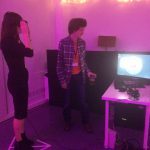 Emily Dodd‏ Brilliant day learning about VR & AR & 360 film & projecting onto strange surfaces & dawn of war characters. 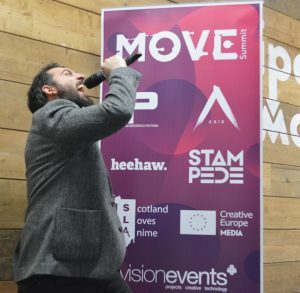 Fraser Reid‏ Had a brilliant day at #MoveSummit Brilliant show of talent in Scotland. Peter Greeves‏ Insights achieved! Keep an eye on this one for 2018. My highlights Axis, Red Knuckles, MPC & Soluis. Emerging talent session ‘Careers Panel’ line up with industry experts – Paul Mackman (host), Will Adams, Elaine McElroy, Mally Graveson, Jon Neill, Hudson Martins and Debbie Ross. Unstable Creations created a captivating custom-made projection for Move Late networking. DeuXality with Movement Music Mixed Reality DJ at Move Late wowed with real-time depth of field wall projection which was live streamed, a world first! All Media Scotland summed up the success of Move. 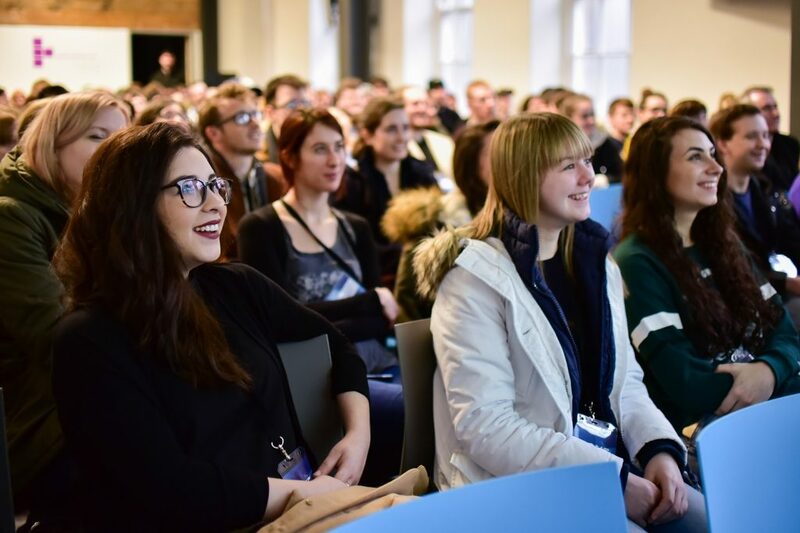 In their blog Axis Animation declared it was: “fantastic to hear from so many talented, young students eager to pursue a career in the creative industries and develop their skills”. 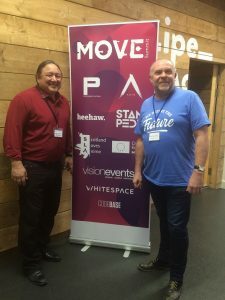 Peter Rodgers at Realise who shared in his blog “Move Summit was certainly a source of inspiration and showcased the risks and rewards of being on the cutting edge”. Students and recent graduates during a break of the emergent talent sessions. We are thrilled to announce that Premier screening of our short film collaboration project, Nothing to Declare, will be at the Edinburgh International Film Festival on Wednesday 28th of June. 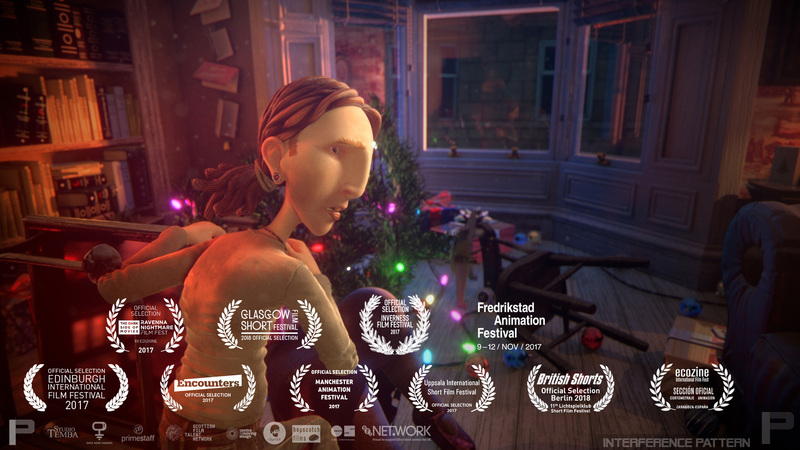 The film will be in competition for The Award for Best Short Film and also The McLaren Award for Best New British Animation. Written by comic artist Frank Quitely, directed by Will Adams of Once Were Farmers, art and technical directed by Interference Pattern ‘s creative director, Tom Bryant, produced by Mal Young of Studio Temba and in association with the Scottish Film Talent Network. Alongside these roles, acting as lighting lead, Tom also lit and composited the entire film. Full details on Interference Pattern’s extensive work on the film can be found on the dedicated portfolio page here. Destined for the international arrivals hallway at Glasgow Airport, we were commissioned to produce a 41 metre wide piece of artwork, depicting a fantastical but recognisable Scottish highlands landscape for Famous Grouse. Measuring 2.6 metres high and to be viewed from very close by, meant dealing with a final output resolution greater than anything we had tackled before and with only two weeks to deliver to the client, the heat was on. Using a blend of CGI and high resolution stock photography, the IP team worked their magic and the final artwork looks fantastic in-situ. Inspiring weary travellers with as they line up for passport control with a glorious fantastical vista of what we waiting for them if they were to hit the road and head North! 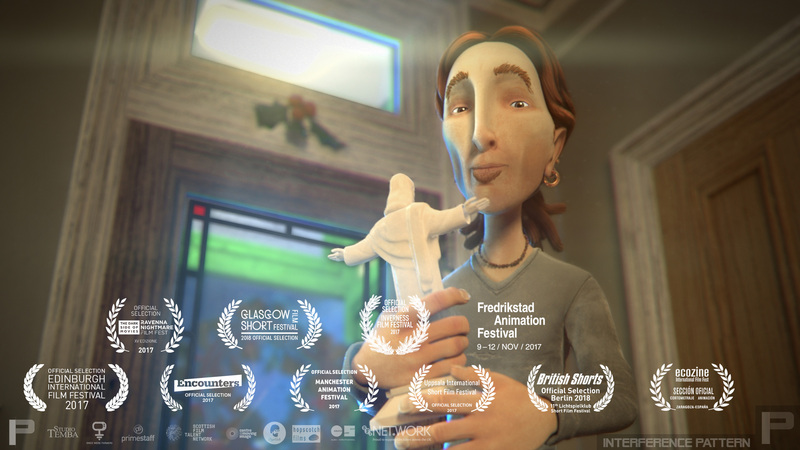 Join us for Scotland’s largest dedicated commercial animation event. We’re bringing creatives together from film, television, advertising, games, and visual arts – to celebrate the joy of making things move. Move Summit offers a rare opportunity to glimpse behind the scenes on some of the most exciting animation work of the last few years. We’re welcoming a top-tier selection of award winning guests, ready to share their experiences of working with household name clients. 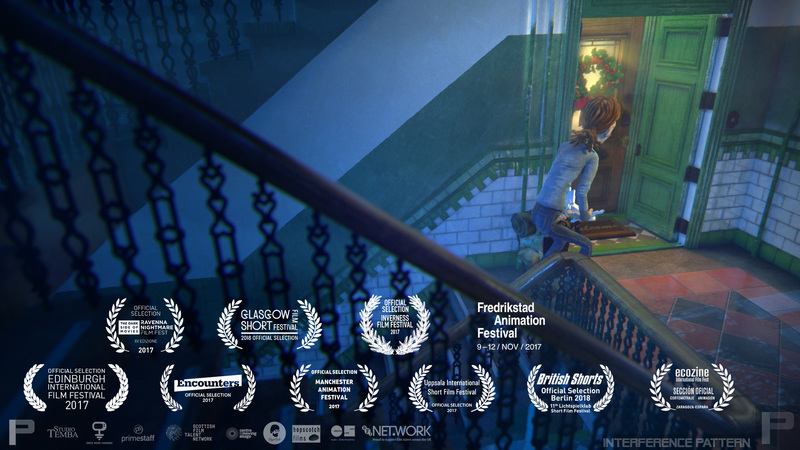 In addition to the top-notch lineup of speakers, attendees can look forward to hands-on technology previews throughout the day and a chance to network with fellow animation professionals at an exclusive evening event in Edinburgh’s bustling Old Town. Overview: Creating seamless photorealistic virtual environments and set extensions for two 30 second TV commercials is right up our street, and this opportunity to flex our cgi muscles was one that we were not going to miss. 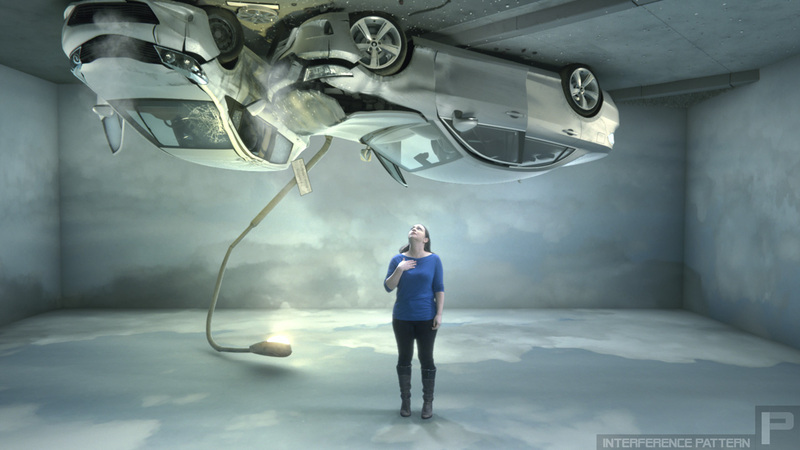 Working with agency STV Creative for client Digby Brown solicitors, we carefully crafted two separate scenarios, one depicting a car crash and another a workplace accident. From on-set visual effects supervision through to the creation and integration of the virtual cgi environments, seamless digital set extensions and touch-up, this was a project that we loved working on. Case Study: If you would like to get the inside story of how we did it, check out the case study, which will lead you through our production process, from initial mock-ups through to final delivery. 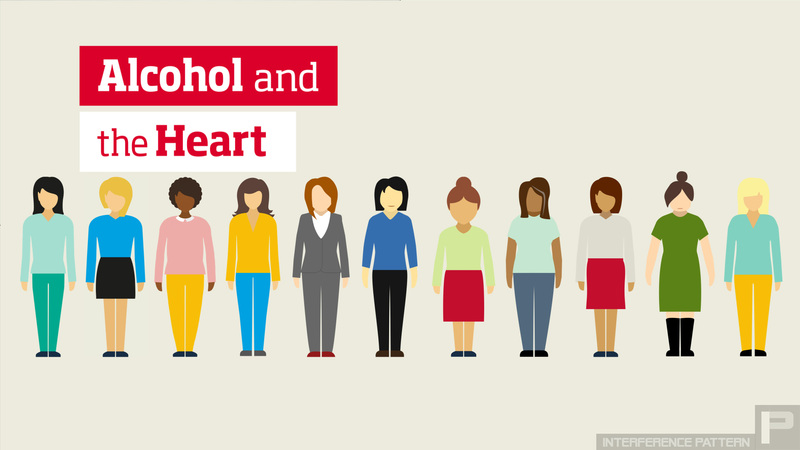 Overview: We produced a series of animated motion graphics to demonstrate how alcohol affects both your short and long term health supporting the campaign to ‘drink a little less and making a big difference to you’. Overview: We created a series of 12 stylized cars from the 1960’s, 70, 80’s and 00’s along with much of the final urban environment in this new Chipotle film, which has had over 7 million youtube views and has screened in US cinemas. 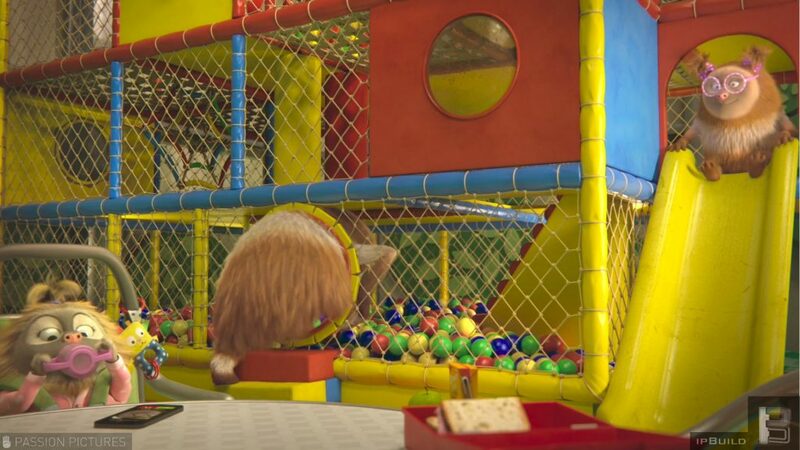 Overview: For the latest funny animation summer outing for the Anchor family we created the play arena and warehouse environment in which the action takes place. Capturing the feel of a miniature hand-crafted physical model was the aim with this asset build, resulting in the inclusion of small details such as smears, blobs of glue and small irregularities which help to sell the idea. 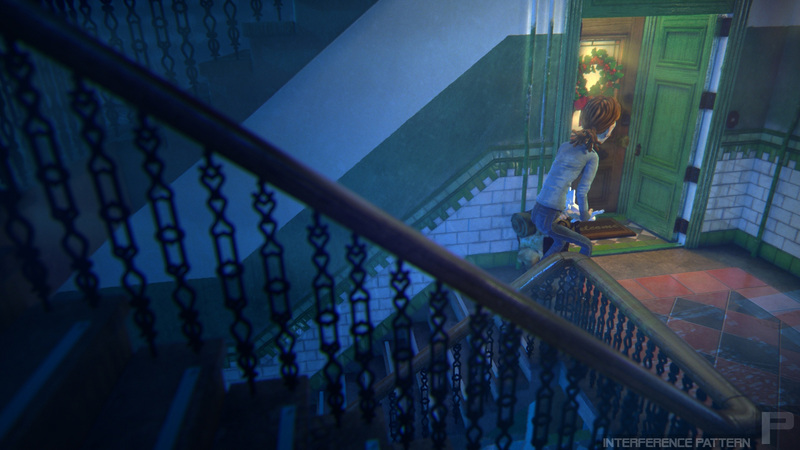 Nothing to declare – An animated horror where the end of the world could start next door. We are delighted to be in the midst of making Nothing to Declare a SFTN commission with Vincent Deighan a.k.a Frank Quitely and Once Were Farmers and Studio Temba. All the character design has been created by Vincent and it’s been a pleasure and challenge to create 3D sculpts of his 2D designs. Vincent has also had a great influence on the interior design and layout of the film, working alongside Fraser MacLean. Interference Pattern is undertaking the entirety of the 3d asset build, 3d visual style development, alongside the shading, lighting, effects, rendering and finally compositing for the full film. The official roles are: Writer: Vincent Deighan; Director: Will Adams; Producer: Mal Young; Technical Director: Tom Bryant. We’re also happy to be working alongside John Cummings (recently from the band Mogwai) who was involved in writing the music for the french thriller The Return (Les Revenants) and are excited to see how his music works with our visualisation of the film. Congratulations to the five other 2016 SFTN commissions, and to Siri Rodnes for Grimm Street a 2015 SFTN commission which became an official selection for EIFF and for which we were proud to undertake some VFX work. Jayne attended SIGGRAPH the 43rd International Conference and Exhibition on Computer Graphics and Interactive Techniques held this year in Anaheim, California. She was delighted to try out the interactive and emerging technology. For a limited time you can view SIGGRAPH session recordings and catch up on the biggest SIGGRAPH announcements in relation to 3D. Whilst in California, Jayne took part in a 2 day character sculpting workshop with uber talented Mike Defeo and Ryan Kingslein in Laguna Bay, in Ryan’s new studio. Two of the IP team were at the 2015 CTN animation expo last year, and were delighted to share this experience with ten other Scottish delegates, all superbly organised by Fraser MacLean . 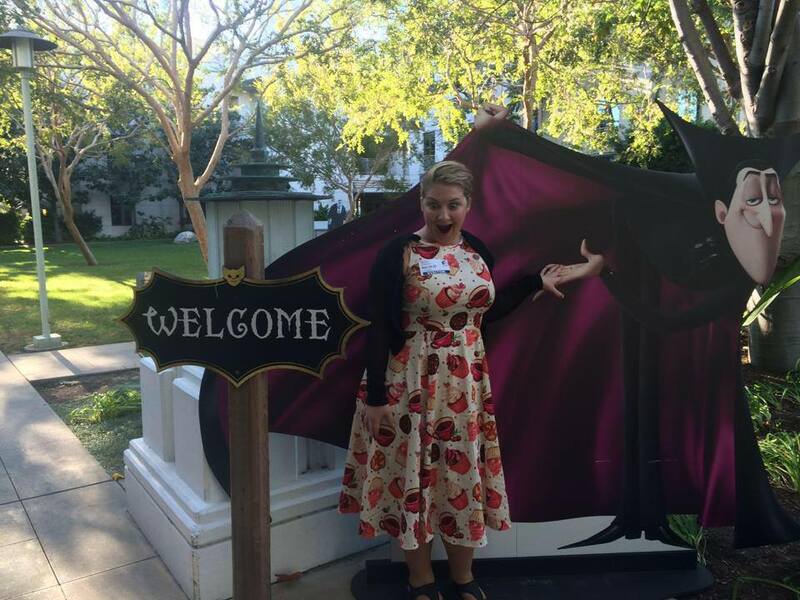 The trip included tours to LA animation studios Titmouse, Dreamworks and Sony Pictures. 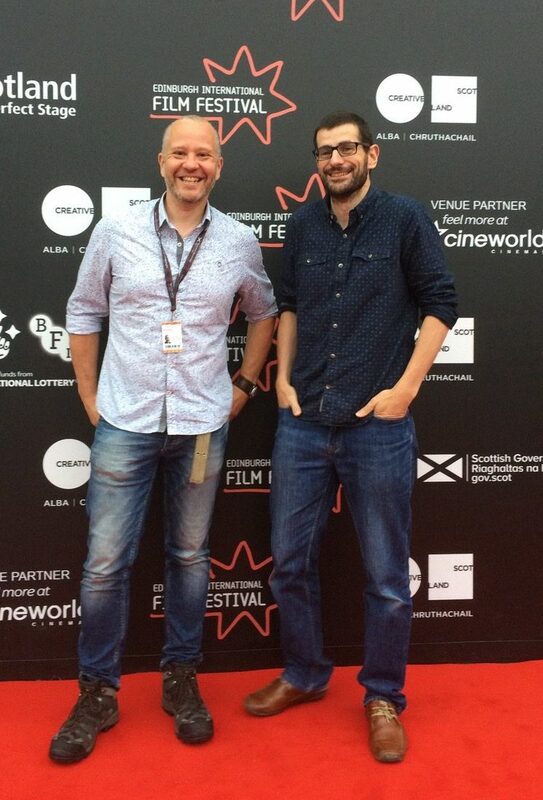 See animator Denis Mallon’s round-up of our trip on the Creative Edinburgh blog. The experience was an intense learning curve and incredible to spend time with veteran animation talents, including Peter Lord. IP producer Matt Brown attended the 2016 Annecy Animation Festival, immersing himself in world of animation from dawn-until-dusk, managing to drop by the occasional after-party during his week. 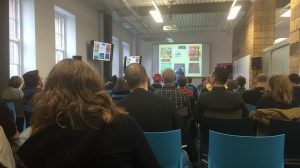 Studio creative Director, Tom Bryant continues to mentor animation and digital media students at Edinburgh Napier University and has also contributed at Glasgow Caledonian University Industry Day. The rest of the team have also been on the road throughout the year helping out students. 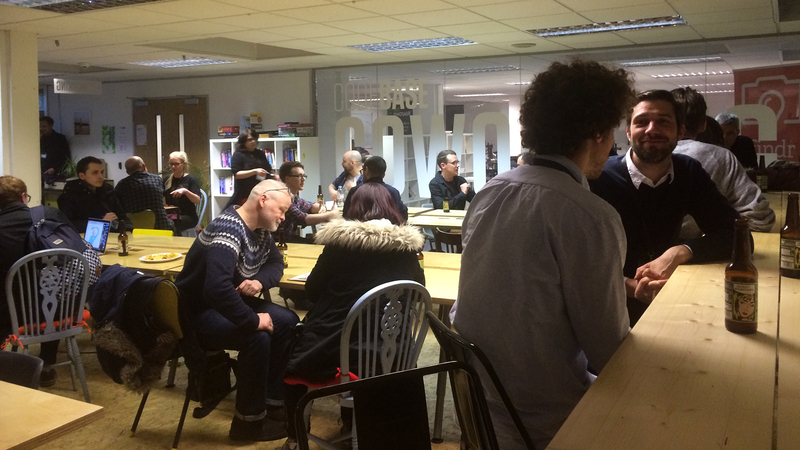 Steve Bell our Senior 3d Artist and Asset Lead graduate portfolio review day at Duncan of Jordanstone for animation students just having graduated. We have had a very talented Edinburgh College animation students and competition winners join us for work experience and mentoring from a couple of days up to a year, most recently Angela who kindly shared her positive experiences. Over the summer months we were also delighted to host an internship for the talented Inès Bourne from l’École Supérieure des Métiers Artistiques, thankfully she had a terrific time with us too. We’ve also hosted two BBC Make it Digital and Skills Development Scotland student interns on the first programme. Hannah and Teeshna were a fantastic help to Jayne on digital projects and valued their time at IP too. Interference Pattern is proud to be leading a collective of animators that are curating an animation community event for next year’s calendar, keep an eye on our twitter account for updates. 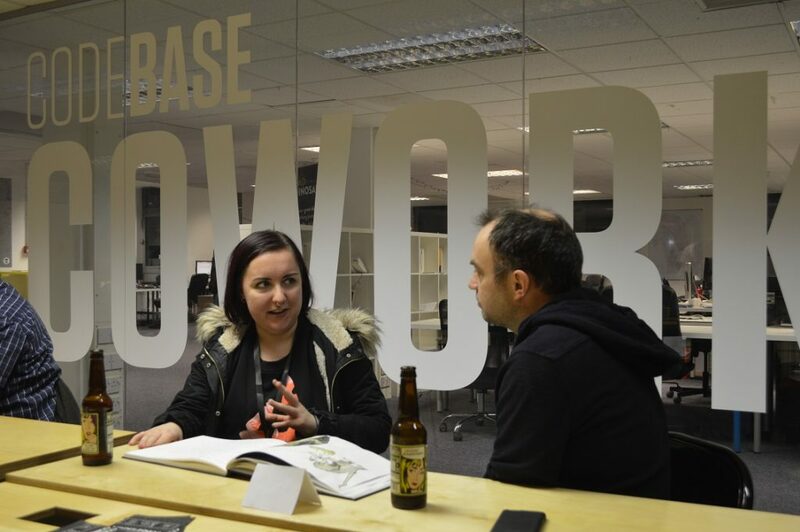 Also follow what Animation Centrifuge are up to next, kudos and congratulations to them on their inaugural bootcamp and workshops successes so far. Jayne made Tom a 3d printed Oscar Academy Award, as he couldn’t take home the Oscar won by The Lost Thing, look out for it if you visit the studio, but you might need your binoculars it is not quite life size! We support Creative Edinburgh as a team member and they created video with Tom Bryant introducing our studio. If you don’t want to wait until our next newsletter in February 2017, please follow our regular posts on Twitter and Vimeo. Interference Pattern ,Techcube, 1 Summerhall Place, Edinburgh, EH9 1QE. Company No. SC344206. 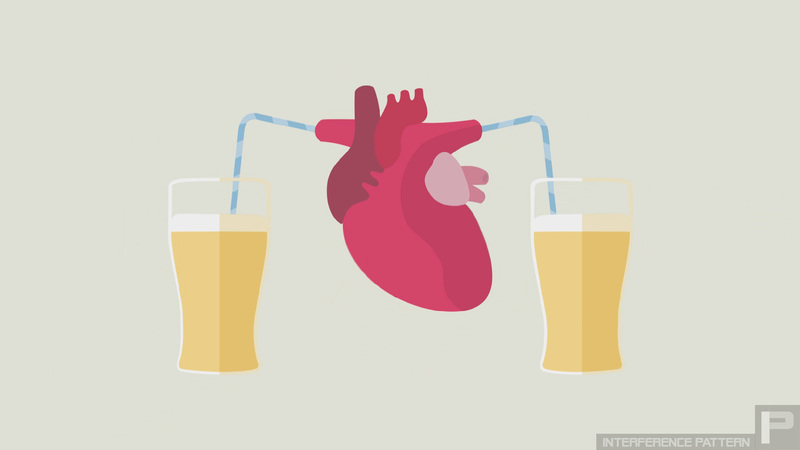 Interference Pattern produced this series of five animated videos with The Leith Agency , to demonstrate how alcohol affects both your short and long term health, giving examples of: ‘the heart taking a beating’,‘less beating elsewhere’, ‘storing up problems’, and ‘beyond a throbbing head’. All to support the @drinkaware campaign of drinking a little less and making a big difference to you. Interference Pattern boldly ventured into the futuristic realm of quantum technologies. How could we resist when Glasgow Science Centre explained enhanced imaging technology developed at the Quantic Imaging Centre could make the impossible possible, by enabling us to have superhero type qualities like seeing round corners? So we were eager to work with the creative masters in helping to translate this remarkable high-science into the public’s consciousness via fun interactive activities. Interference Pattern produced and animated four exciting short films for the exhibition, highlighting the ideas and science behind concepts. 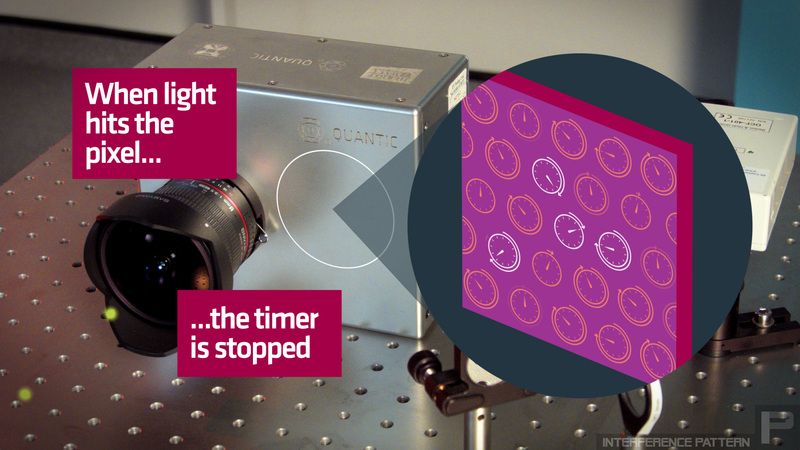 It’s on the top of our ‘to do’ list to visit the #askquantic exhibit to witness how our series of films and animations is integrated into the #makingtheinvisiblevisible, designed to illustrate the spectacularly exciting quantum technologies from lab to industry. Working with the Leith agency, Interference Pattern created this quirky 2d animation for the Scottish Government’s “Know the Score” campaign. In this case highlighting the potential dangers of mixing legal highs, or NPS’s with alcohol or other drugs. 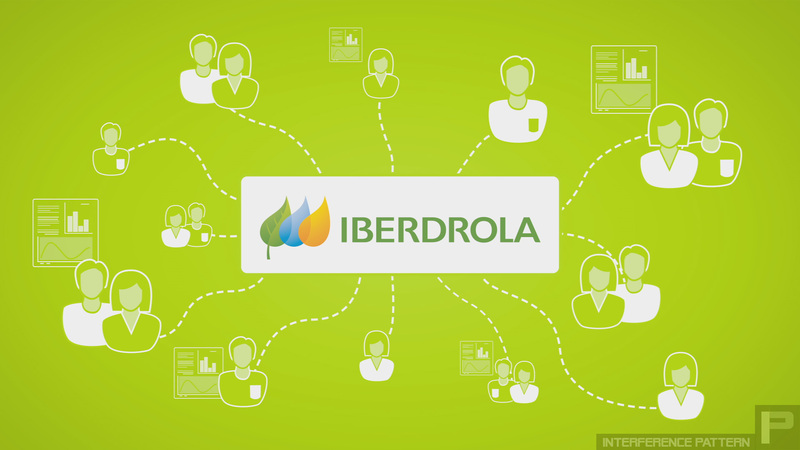 Working alongside our friends at The Leith Agency in Edinburgh and fresh from the hearts and minds of Interference Pattern’s animation team, comes the second of two slick motion graphics animations for Iberdrola. 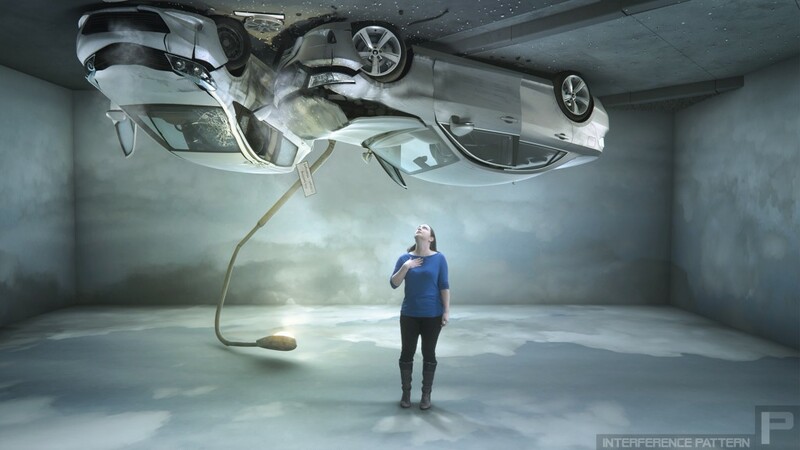 The team has recently completed work on this second commercial in Digby Brown’s “Upside Down” campaign, for STV Creative, which this time around focuses on an accident in the workplace. 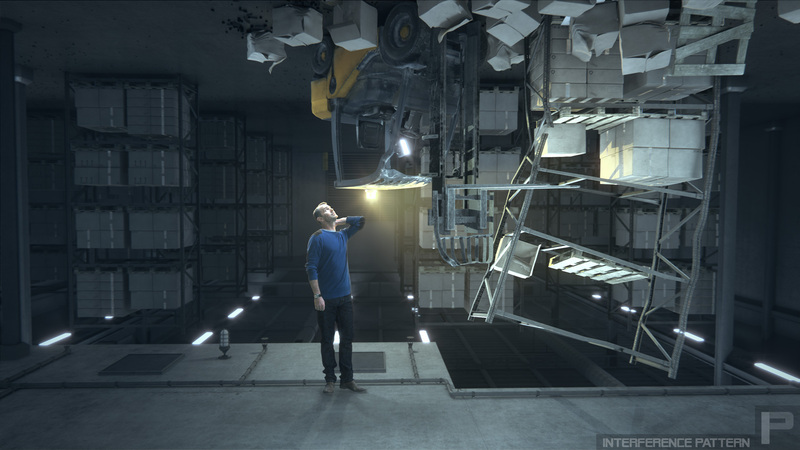 Interference Pattern undertook all aspects of the cgi work, from on-set visual effects supervision right through to creation and integration of the virtual cgi warehouse environments and seamless digital set extension. Working alongside our friends at The Leith Agency in Edinburgh and fresh from the minds of Interference Pattern’s animation team, comes this playful motion graphics animation for prominent Scottish Law firm, Burness Paul. With a creative brief of translating the playful, yet serious approach of the company, whilst maintaining their premium brand image, this short piece hits the mark. 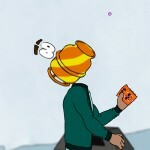 Has your world been turned upside down? Interference Pattern’s vfx team recently completed work on this captivating commercial for Digby Brown solicitors. From on-set visual effects supervision right through to creation and integration of the virtual cgi environments and seamless digital set extensions, we made sure that this spot delivers for the client and audience. Read more about the work here. 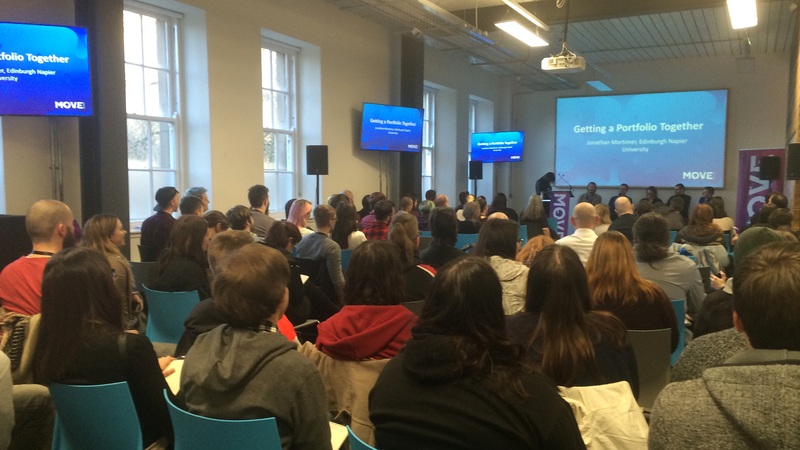 “I recently attended and presented at the Glasgow Caledonian University industry day for the 3D Animation faculty. 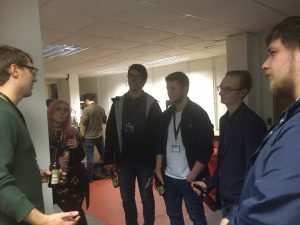 It was a great chance to meet some of the students, see examples of their work and give a little feedback, from the industry point of view, as to how their work potentially could be developed further. I started my presentation by talking a little about my journey into the cgi animation industry and subsequent journey over the past 15 years. This led into a brief coverage of getting my own studio off the ground in the form of Interference Pattern, what working here might look like for a recent graduate and also what we look for in a student portfolio when are recruiting for positions at the studio. 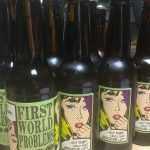 I followed this up with a brief case study, covering a few of the techniques that we used on production of The lost Thing, which were designed to enable a large workload to be managed by a very small team. Also talking was veteran VFX supervisor Steve Begg. It was truly amazing to hear about his journey through the visual effects industry, from practical model making to feature film vfx supervision. He has worked through the introduction of the digital special effects era, embracing all that the technology has to offer. His work spanning model making and special effects for the original Thunderbirds TV show and James Cameron’s Aliens, right up to vfx supervisor on the latest Bond film, Spectre. Such an incredible body of work. 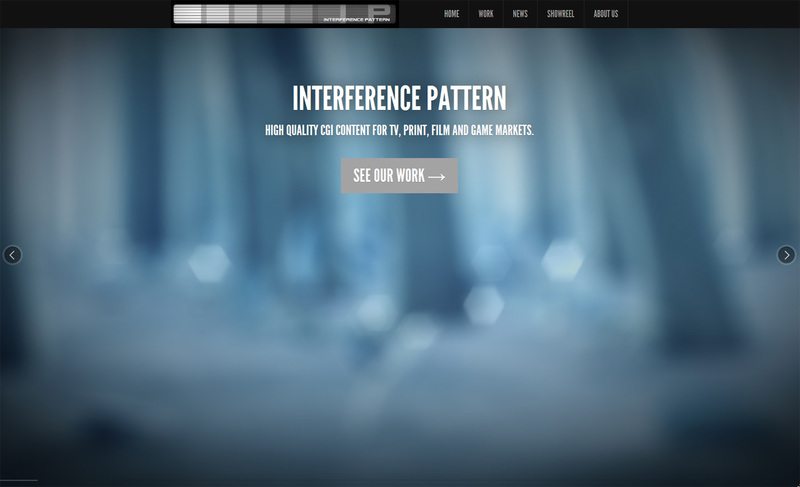 Tom Bryant – Creative Director, Interference Pattern. As IP’s international emissary, Tom, recently returned from a rather interesting and enlightening trip to Shenzhen in China. The primary purpose of the trip was to investigate both the business and cultural landscape of the animation and VFX industries in Shenzhen, with a view to developing commercial relationships, partnerships and collaborations with industry and educational institutions. 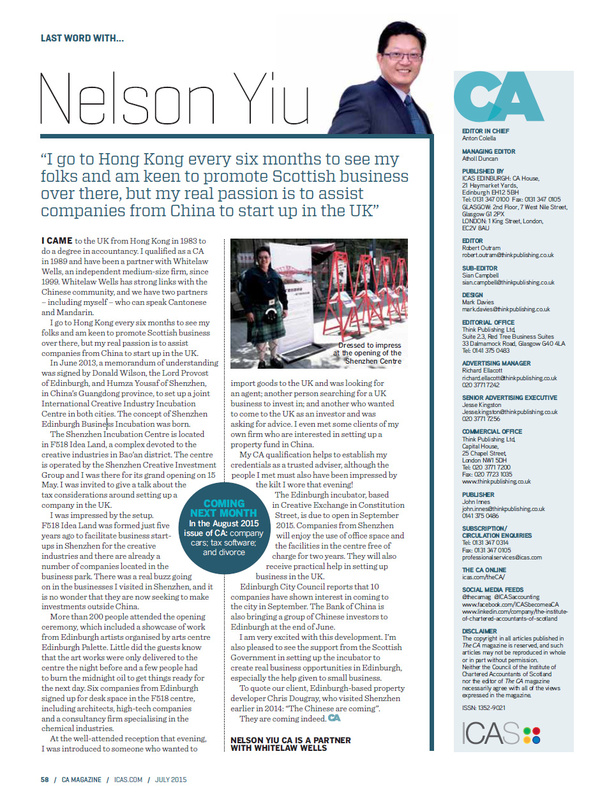 “The trip to Shenzhen, China was an amazing opportunity to explore the new business potential of the worlds emerging cgi industry in China. On the second day of the trip the members of the delegation all presented at the “Sino-UK Higher Education Forum on Animation and Games”. I talked on the origins of Interference Pattern, reviewed some projects that we have been involved with and then talked over issues we have come across during productions and how we have solved them. There was a focus on the work we did with “The Lost Thing”, due to it’s relevance to the overall purpose of the forum, which was to discuss the potentials and pitfalls of international collaborations. Over the course of the week we had some great meetings with companies and organisations both in the cgi animation and vfx/post-production realms. In the latter part of the week we were attending the ICIF (International Cultural Industries Fair), a huge cultural expo event held annually in Shenzhen. We had an area made available to us at a stand, where we could talk with expo attendees about our companies and services. I even managed to be talked into an interview on the local TV channel to talk about my experiences and how I had found both attending the ICIF and my impressions of the vfx sector in Shenzhen. Alongside the business exploration side of the trip, Edinburgh Council were also opening the Edinburgh Shenzhen Business Incubator. 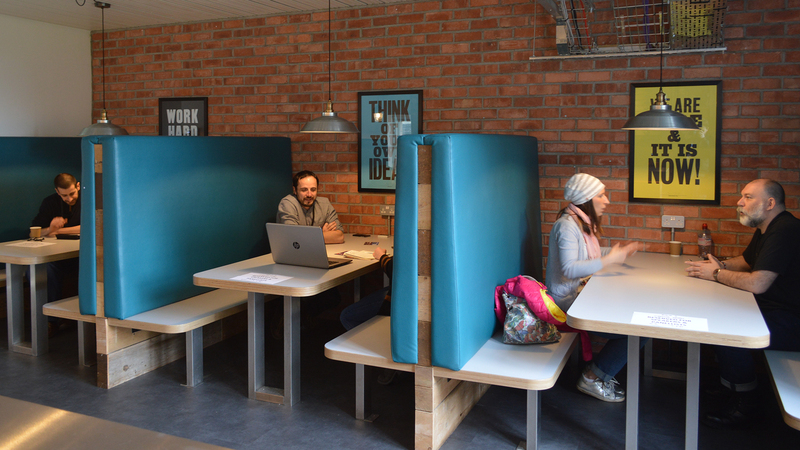 The Business Incubator provides facilities for Edinburgh based businesses to help them establish themselves in China. 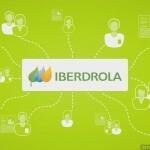 Providing a foothold in an unfamiliar country and culture, from which to launch their operations. Overall it was a thrilling trip. To see the furious energy and expansion of Shenzen first-hand was awe inspiring. 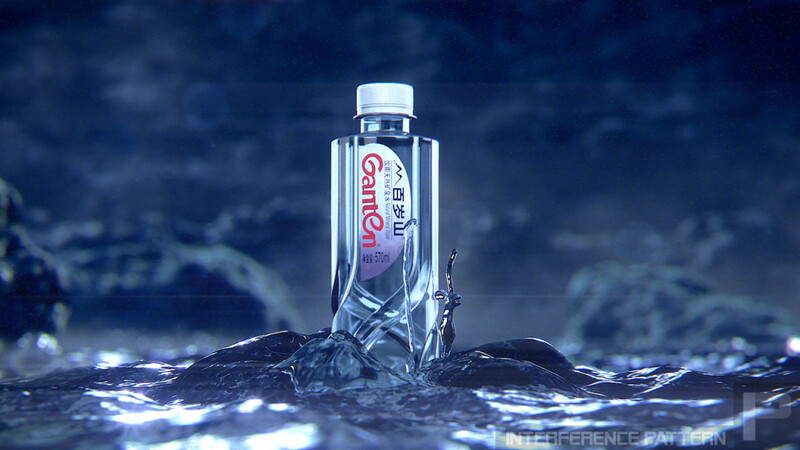 Ganten mineral water: 100% CGI product shot, showing the signature bottle, rising through the water’s surface. We were asked by local Edinburgh-based production company Freakworks to tackle a challenging 100% cgi product shot, to be inserted into a Ganten mineral water commercial. The brief, to show a bottle of Ganten mineral water, rising up through the surface of a turbulent stream, breaking through the water in a majestic but serene manner. With the added challenge of a fast turnaround and delivering four different versions of the sequence, all at a beautiful but render intensive 4k resolution, we dived straight in, with our usual aplomb. The finished shot looks great and with all clients very happy with the result, we can say job well done and it’s onto the next project. Glasgow 2014 – Clyde’s great sporting moments. It’s taken us a while to get this work from 2014 online but we can now let you see something else we were up to last Summer. In a departure from our usual highly detailed, pre-rendered work, these real-time assets were created for IC MobileLab‘s Commonweath Games augmented reality app, Catch Clyde. We sculpted the Game’s plucky mascot Clyde, in a series of eight individual sporting poses, alongside detailed representations of three of the main sporting arenas. 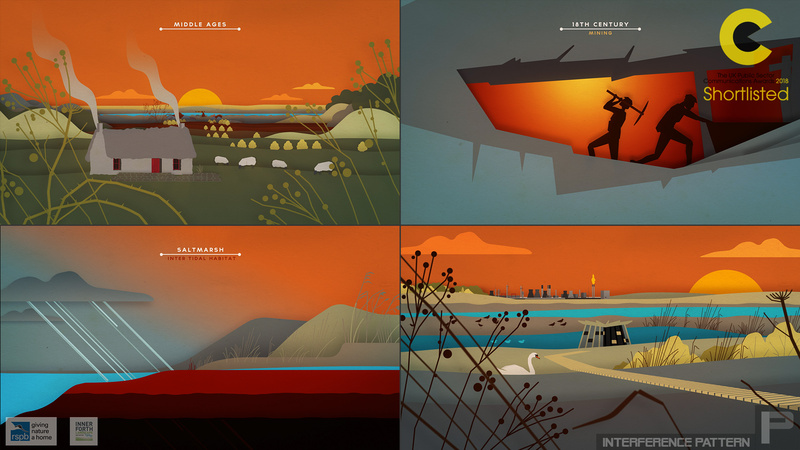 See further artwork and work in progress images from the project on our insight page. Do you know somebody famous? 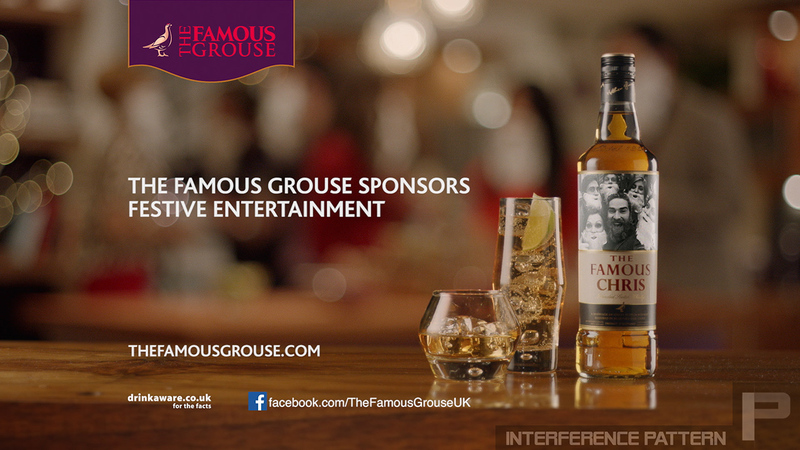 A series of packshots created for The Famous Grouse “Make Somebody Famous” campaign. Working with MTP and The Leith Agency we created a series of pack shot sequences for Famous Grouse’s make someone famous campaign, for territories throughout Europe. In total six different shots were created to cater for the differing broadcast requirements and regulations in the various regions. Christmas channel sponsorship bumpers for STV/Barrhead Travel. A series of fun Christmas themed channel sponsorship bumpers for STV and Barrhead Travel’s Christmas gift vouchers, recently rolled off the production line here at IP studios. 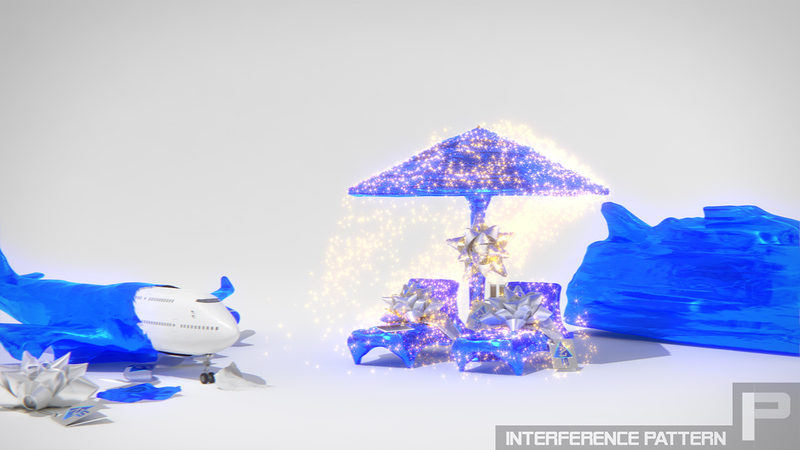 Produced for STV Creative, the simple but effective animations show a variety of recognisable holiday-themed objects, wrapped in Christmas wrapping, partially reveal themselves in a show of Christmas sparkles. They certainly got us in the mood here at the studio. Dobbie the 10th reindeer, journeys home to Dobbies, this Christmas. Our latest work has just hit the small screen, and we think it looks just fab! 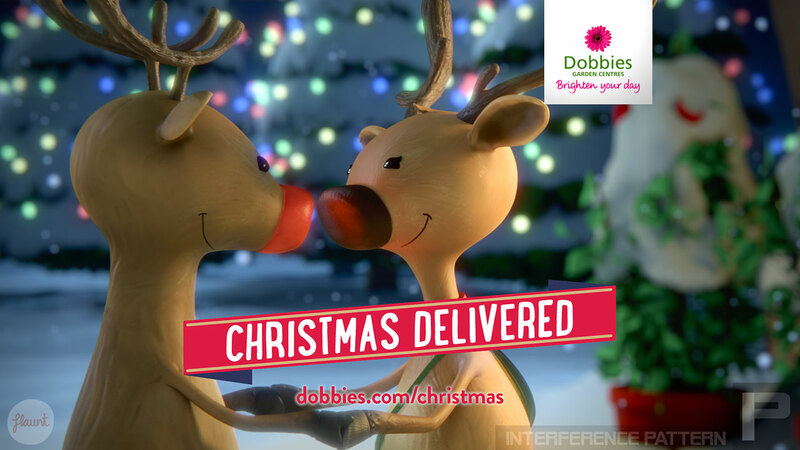 Working in conjunction with Flaunt Productions, for the Leith Agency, our team has been hard at work throughout September and October bringing this Christmas commercial for Dobbies, to life. 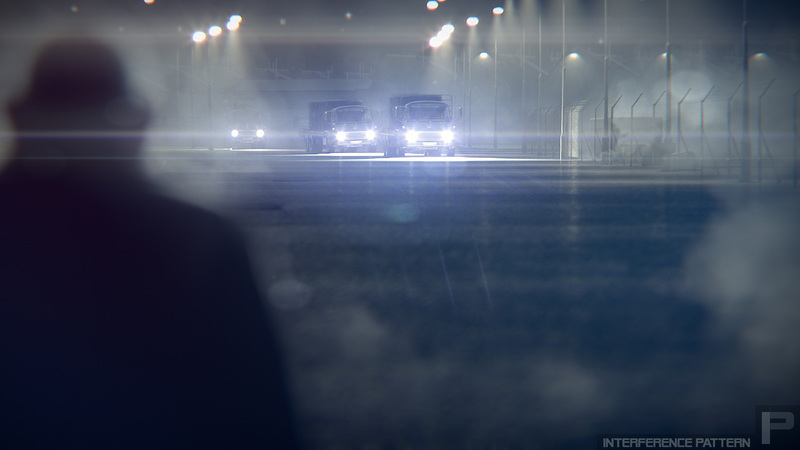 Interference Pattern undertook production all of the asset builds (modelling, texturing and shading), followed by the lighting, rendering and compositing of this 40′ commercial. The project has certainly put our new coffee machine through it’s paces. Check out the full commercial for yourselves over here. Have you packed your wellies? 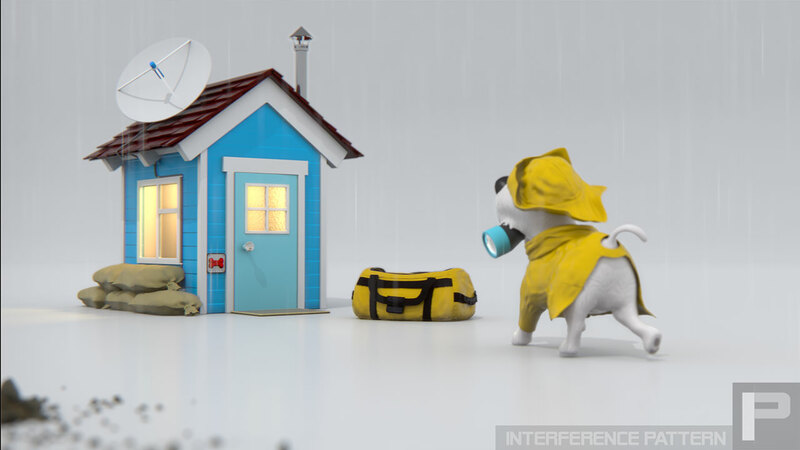 Still hot from the render farm, check out our recent animation for the latest TV advert for the Scottish Government’s 2014 Ready for Winter campaign. Completed for The Leith Agency, we set our animation team the tough task of bettering the spot we did for the campaign last year. We think they succeeded by a mile, but take a look at the spot yourself and let us know what you think. Don’t forget to pack your wellies. TV advert created for the Scottish Government with The Leith Agency. Oooh, check out that view! So we’ve just moved into our new, larger studio space in the Techcube, just around the corner from our old studio at Summerhall. The boxes are all unpacked and most importantly we’ve spent some time testing out the new coffee machine. It’s getting the thumbs up from everyone here at the studio, so drop on by for a chat if you’d like us to make you a cup. Luckily the interior is a little more inspiring than the exterior and we are surrounded by companies doing some really interesting things. 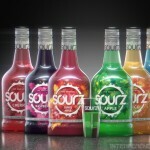 Our snazzy new CGI pack-shot for the Sourz re-branding (Final grade and flares by mtp). 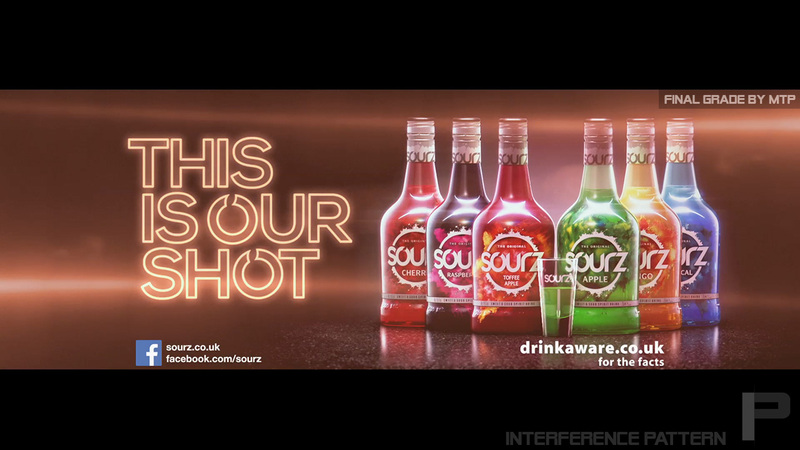 To accompany Sourz’s recent re-brand, Interference Pattern were tasked with seamlessly replacing all of the original bottles in the existing “This is Our Shot” commercial, (produced by MTP in 2013) with shiny new CGI bottles, bearing the updated Sourz branding. Working from the final pre-grade plates, with little information available from the original live-action shoot, we worked our magic to deliver the re-branded versions to a very happy client. To round off the updated commercials, we created new fully-CGI pack-shots, emulating the look of the original shoot, whilst updating and refining the look to give the pack-shot that extra ‘wow’ factor. CGI bottle replacement for Sourz “This is Our Shot” commercial in the Netherlands. 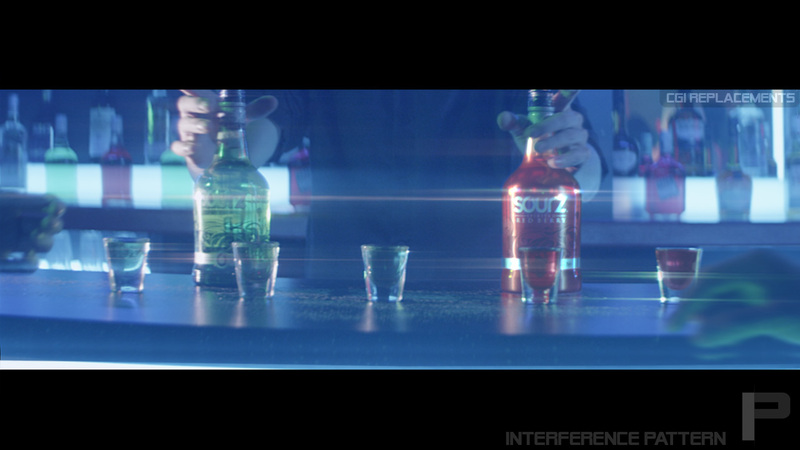 To accompany the launch of Sourz’s “This is Our Shot” commercial in the Netherlands in 2013 (produced by MTP), Interference Pattern was tasked with replacing one of the flavors of Sourz featured in the existing commercial, with a bottle of a different variety. Again working from the final pre-grade plates, with little information available from the original live-action shoot, we delivered the substituted flavour to a very happy client. 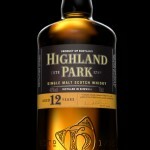 Our slick photo-realistic cgi whisky bottle for Highland Park’s Hogmanay sponsorship bumper, on STV. 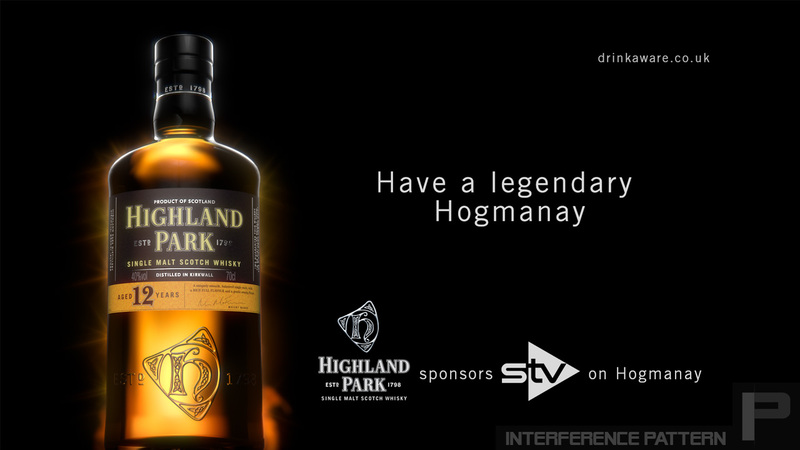 Our last job of 2013 at IP saw us create a fiery photo-realsitic whisky bottle, for Highland Park’s Hogmanay channel sponsorship bumper on STV. Another great wee job for the guys ‘n’ gals at STV Creative, especially as we appreciate the occasional wee dram here at Interference Pattern. A little touch of magic on Leith walk. 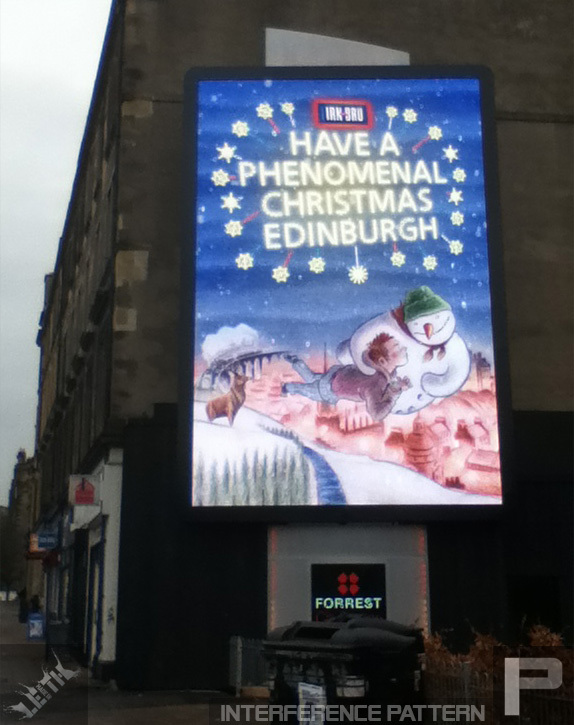 Motion graphics artist Darren McNaney spotted the Irn Bru Xmas screen on Leith walk earlier in the month. We added a little sprinkle of magic to these simple spots with some lovely snow and light animation. Heartwarming character animation for the Scottish government’s ‘Ready Scotland’ campaign. We recently completed this short channel sponsorship ident, for the Scottish Government and STV. 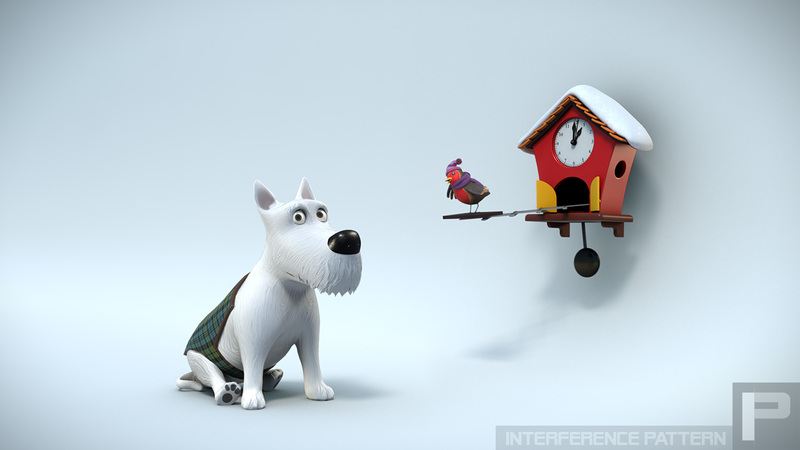 Working with STV Creative and The Leith Agency, this cheeky 10 second spot was a timely reminder of the annual autumnal changing of the clocks, as part of the Ready Scotland’s Ready for Winter campaign. Slick CGI environments for “Sourz -This is Our Shot” commercial. We’re excited to show some of our work on the latest ‘Sourz’ commercial, titled “This is Our Shot”. Working alongside Scott Taylor vfx, for mtp and The Leith Agency, we set our team of 3d artists to work creating the stylized but realistic cgi Earth and cityscape through which we pass, setting the scene for the remainder of the action. We then handed over to Scott Taylor vfx, for final grading and integration with the subsequent live-action sections. The full commercial can be viewed online, here. 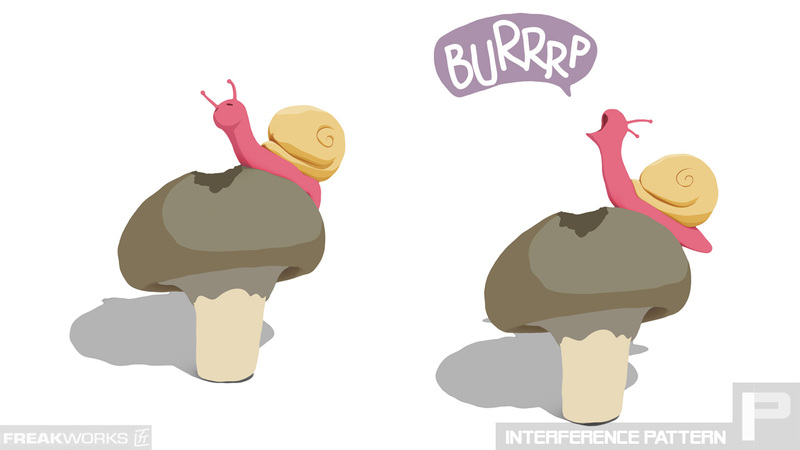 We’re currently recruiting for a paid internship position for a 3d artist/animator here at Interference Pattern’s studio in Edinburgh. If you’re a graduate, aged 18 to 30, residing in Scotland and wanting to get you hands on an awesome internship opportunity at a vibrant up-and-coming animation studio, please get in touch. 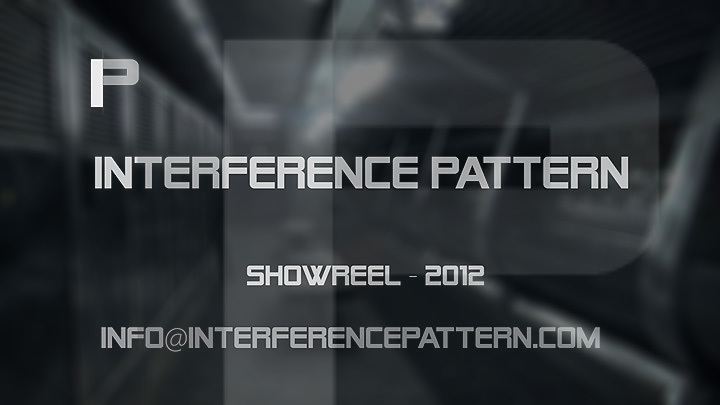 Email showreels, portfolios and supporting statements to info at interferencepattern dot com please. Closing date is Friday the 15th of November. Applications must be made through the Job Centre and there are some eligibility criteria to be met. More details on this can be found on the SCVO website http://www.scvo.org.uk/training-employability/creative-internships/intern-information/ . 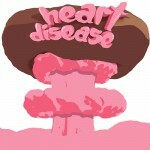 More stop-motion 2d-style 3d animation, for the PHA’s “Choose to Live Better” campaign. Check out the new video of our latest animation, created for Northern Ireland’s Primary Health Agency’s ‘Choose to Live better’ campaign, which has just hit the small screen. 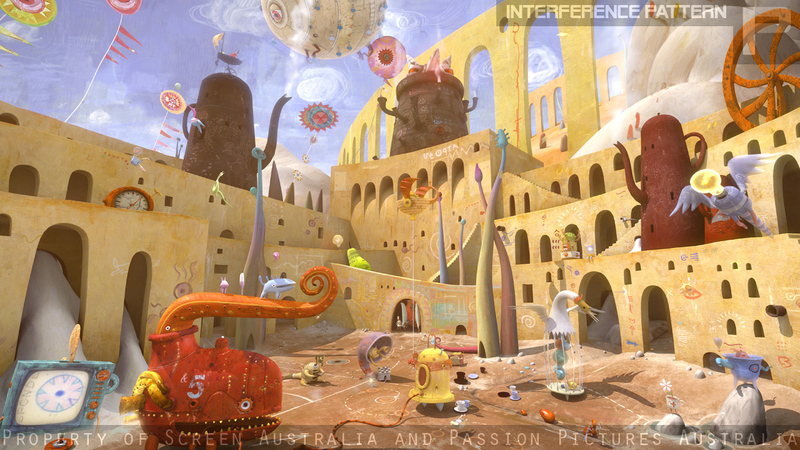 Produced for Freakworks, who then went on to print the ultra-high resolution frames onto TShirts, filming them in the studio, to produce the final stop-motion sequence. Click on the image above to view the video of our contribution to this project. We recently produced another 40 seconds of animation for the latest in a series of infomercials for Northern Ireland’s Primary Health Agency, which has just hit the small screen. 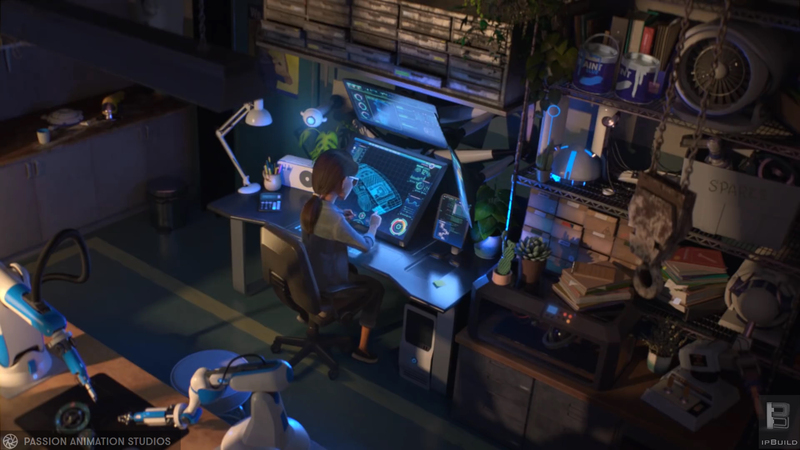 Combining 2d and 3d animation and building upon the look stop-motion style developed for the previous spot, this time upping the complexity of the animation. We again rendered the animation at a very high resolution, enabling Freakworks to then print the frames onto TShirts and film them in the studio and then assemble, to produce the final stop-motion sequence. 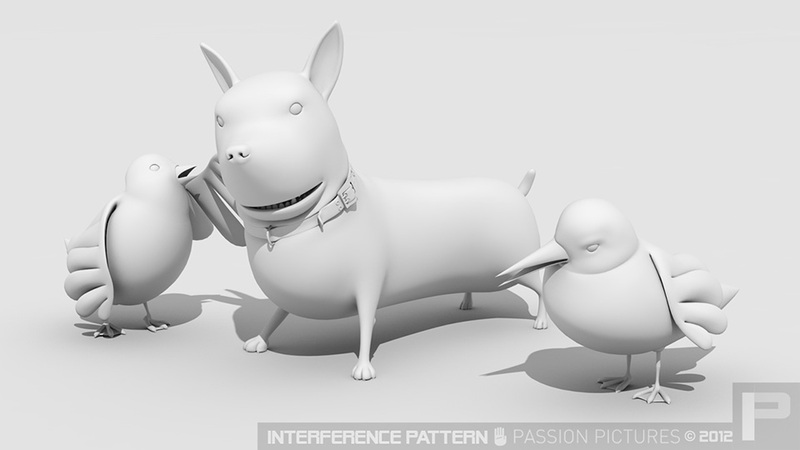 A selection of cute and quirky animal models created for Passion Pictures for their recent Toyota Prius – ‘Hum’ commercial. 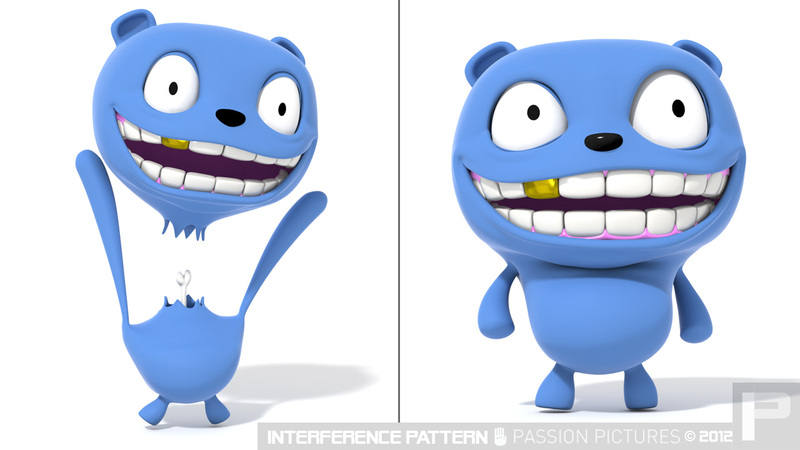 Click the image to view more from this project in the ‘Character Modelling’ gallery. 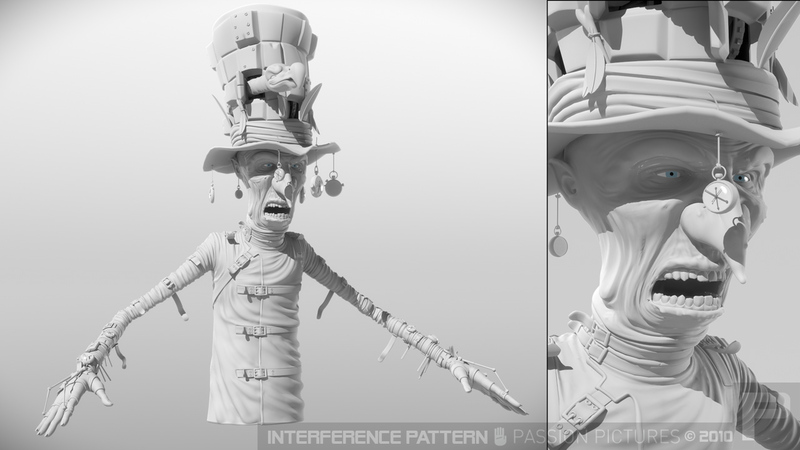 “Waldo” character model. Created for an episode of ‘Black Mirror’, shown on Channel 4. Last year Passion Pictures asked us to model up a kooky wee character, going by the name of ‘Waldo’, for an episode of Black Mirror, on C4. Here he is, in all his anarchistic glory. Click the image to view more from this project. Eilean Donan castle in the 17th century. 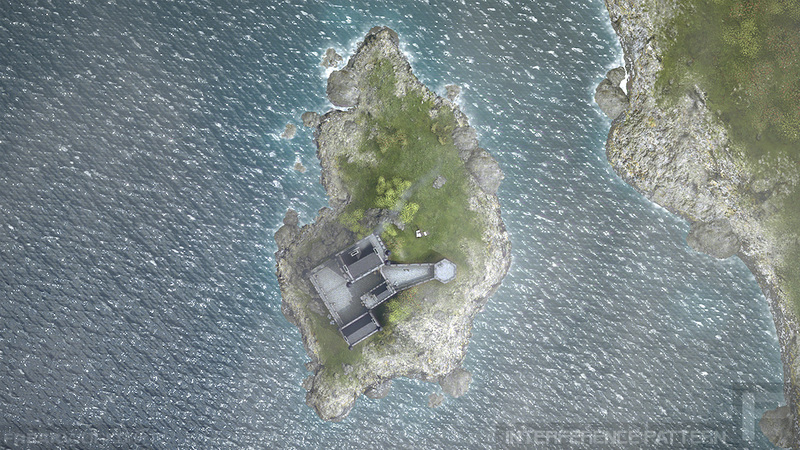 We recently created several minutes of realistic cgi animation involving a historic representation of Eilean Donan Castle, in the highlands of Scotland. To be incorporated as part of a new audio visual display at the castles visitor centre, the animation depicts three separate phases of construction of the castle, through the 13th, 15th and 17th centuries. Loose a few lb’s, with the PHA. 3d animation but in a 2d stop-motion style, for PHA infomercials. 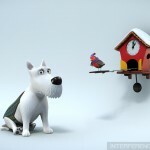 We recently crated 40 seconds of quirky 3Danimation. but done in a 2d stop-motion style, for a series of infomercials aimed at tackling rising levels of obesity for Northern Ireland’s Primary Health Agency. For the final film, local production company, Freakworks took the animation we created and printed the high resolution rendered frames onto TShirts, which were then filmed being worn by an actor in their studio. 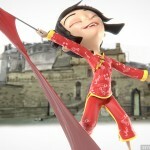 The result is original and highly effective animation. Tracking, animation, character removal and seamless integration for a PHA infomercial. Shot tracking, rotoscoping and integration were the name of the game for the work done for this informercial, which is aimed at tackling rising levels of obesity for Northern Ireland’s Primary Health Agency. Based on an already existing material, Interference Pattern animated new tape measures, tracking and integrating perfectly them into the existing footage, finishing things off with a nice new colour grade. 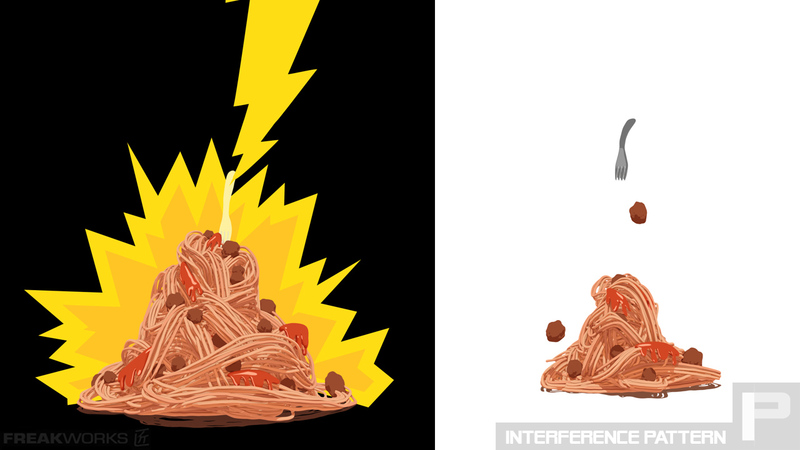 While we were at it, we seamlessly removed one of the characters from the original version. All work carried out for Freakworks. We’ve just put the finishing touches to the new showreel, showcasing some of the latest and greatest from the last few year’s archives. Have a look and get in touch to let us know what you think. It’s got that new studio feeling! 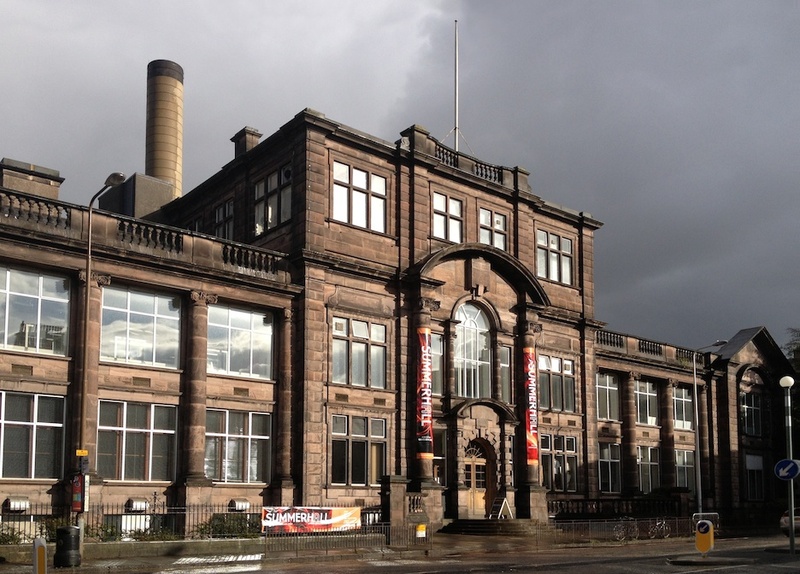 That’s us all moved in and settled in at the new studio at Summerhall in Edinburgh! It’s a lovely building in a fantastic location, with it’s own cafe and located right next to the Meadows. It’s even got it’s own bar. What more could one want! Now that’s a snazzy frontpage for the new website! The new website has just gone live! Have a look around, check out the latest work and get in touch with your thoughts. With a very tight deadline and with grand plans afoot, Interference Pattern assembled a small but elite squad of artists to deliver 15 seconds of CGI animation for this years TV commercial for the 2012 Royal Highland Show. With a turnaround time of only 3 1/2 weeks, including design, we think that the results speak for themselves. More samples can be seen in the main gallery. Produced for Freak Works. 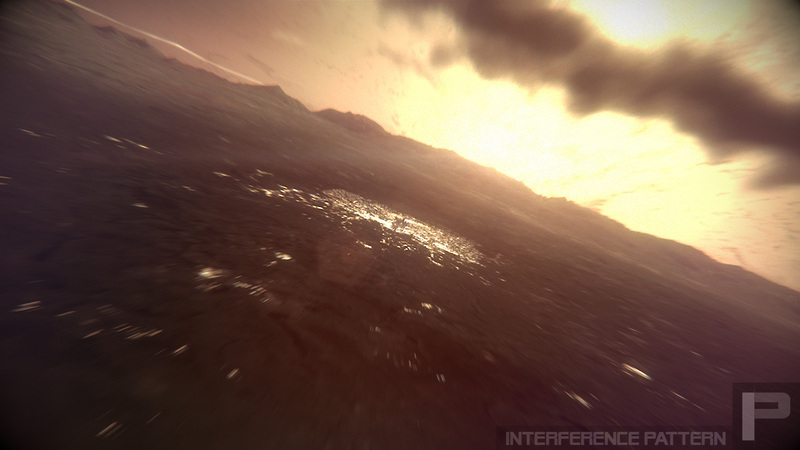 Environment creation for Aliens Colonial Marines game trailer. 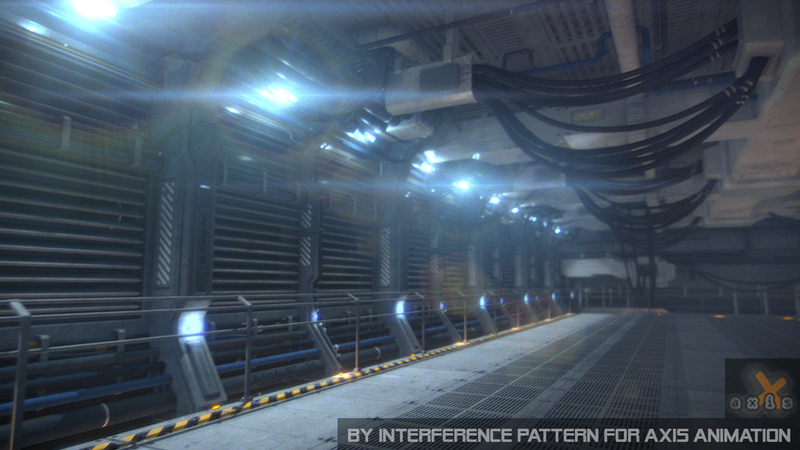 Interference Pattern recently completed several pieces of highly detailed environment creation for Axis Animation for their ‘Aliens Colonial Marines’, game trailers. 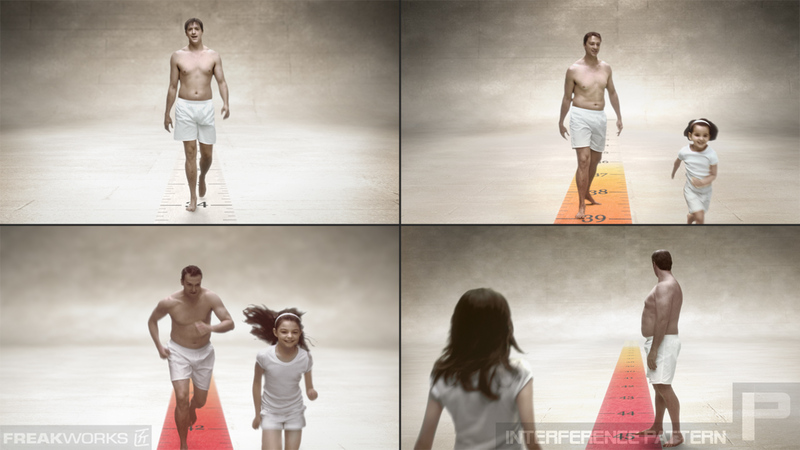 Character creation for CIF TV commercial. 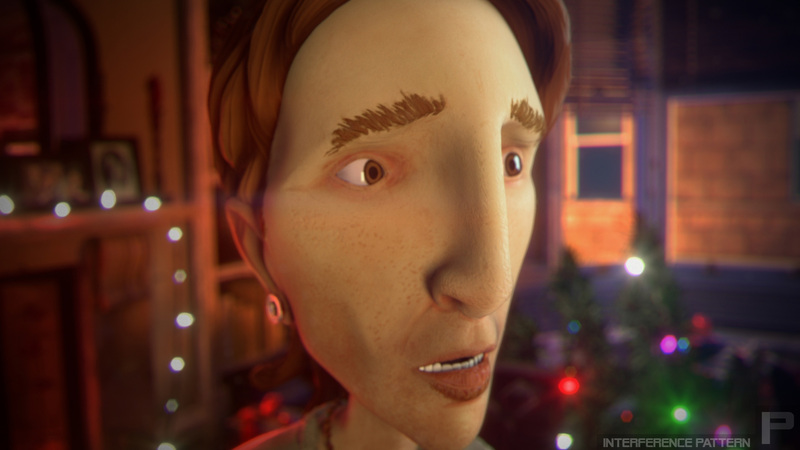 Work was recently completed creating characters for the latest CIF commercial for Passion Pictures. 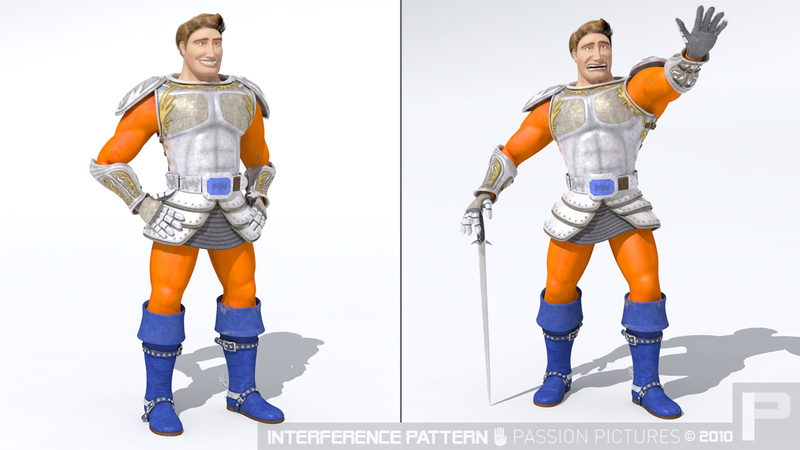 Interference Pattern created the ‘goofy guard’ and ‘Mr Muscle’ characters to the highest specifications demanded by the commercial’s directors.